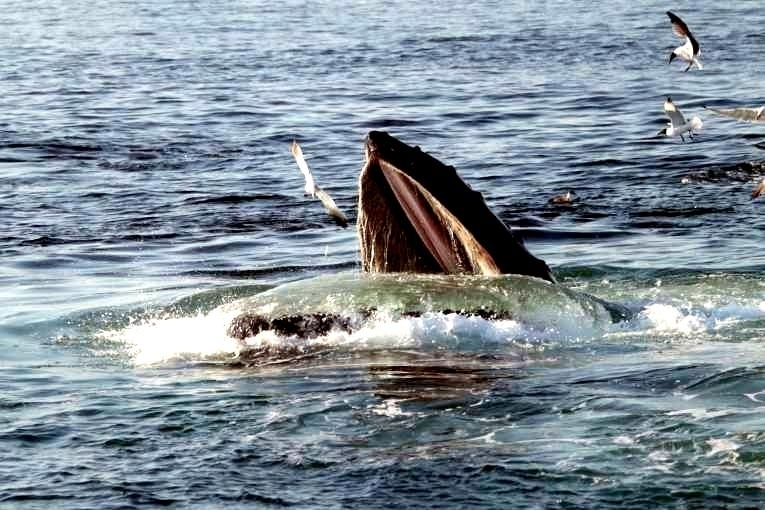 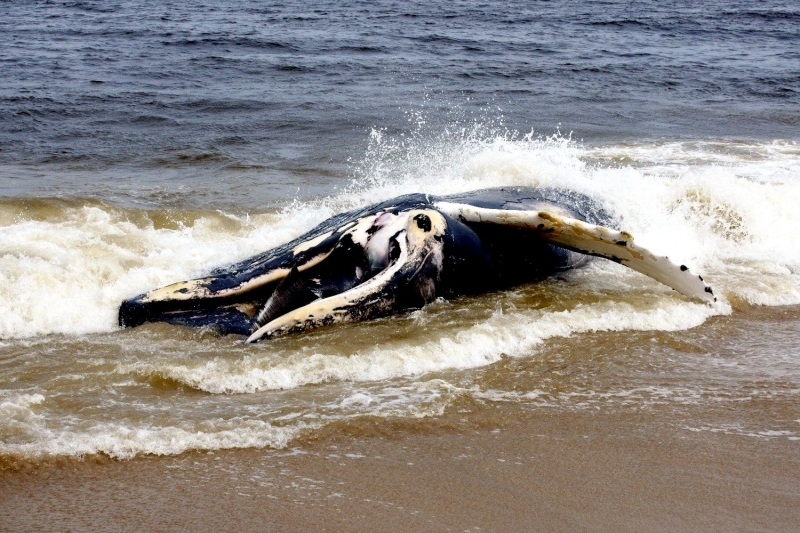 The Humpback Whale is a baleen whale which performs complex and cooperative feeding techniques. 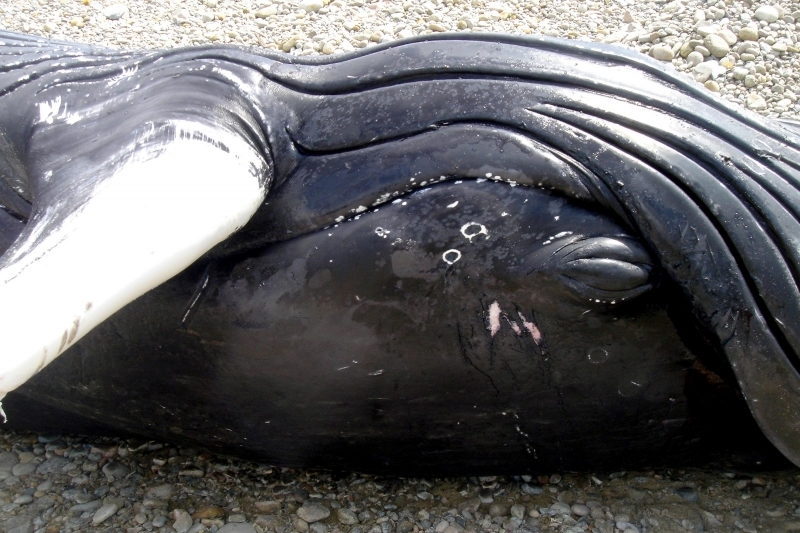 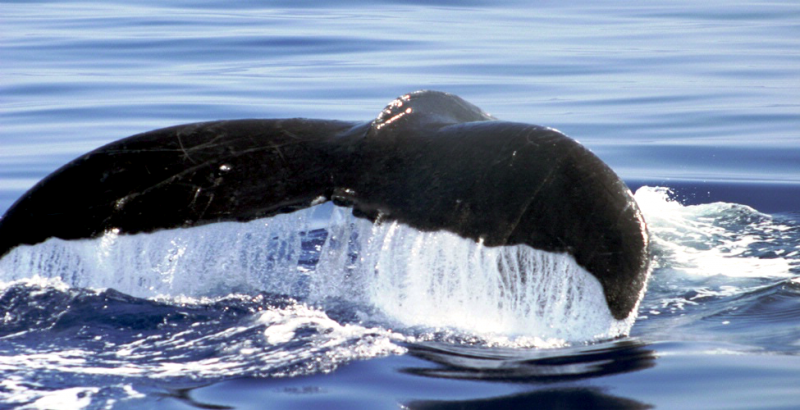 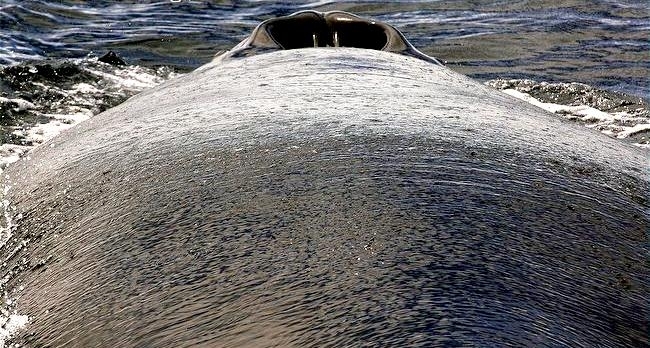 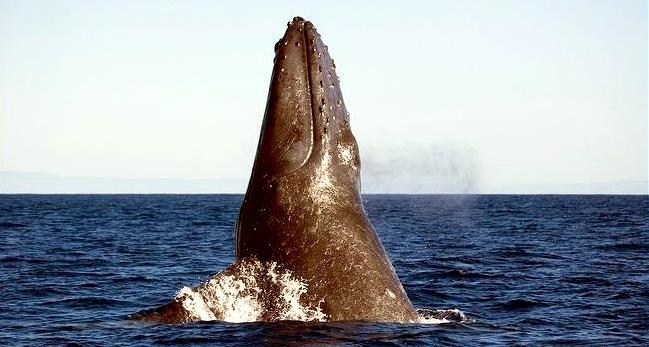 The Humpback Whale has a bulky head with bumpy protuberances known as tubercles, each with a bristle. 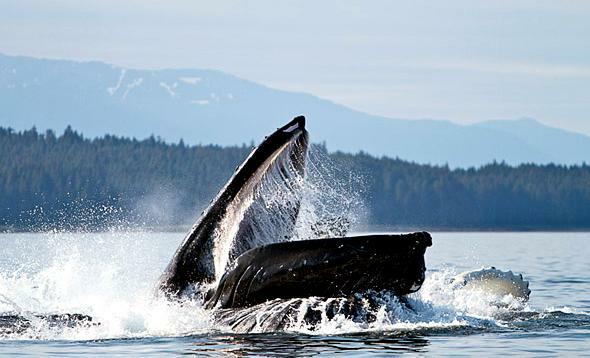 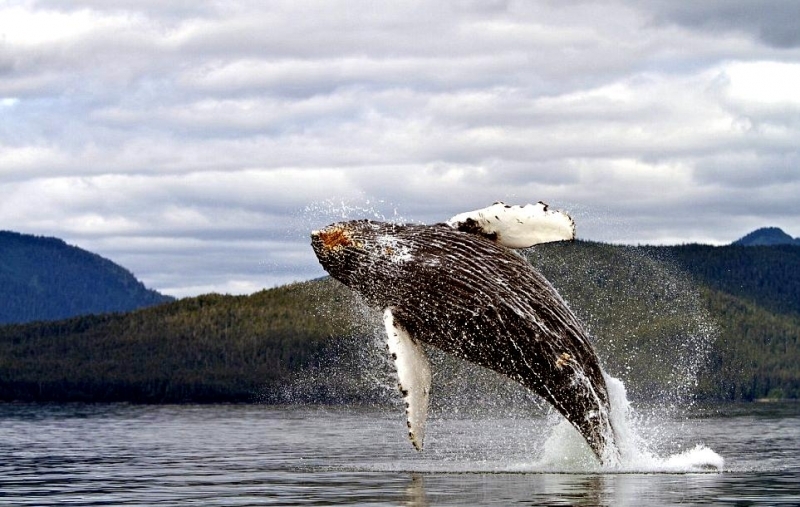 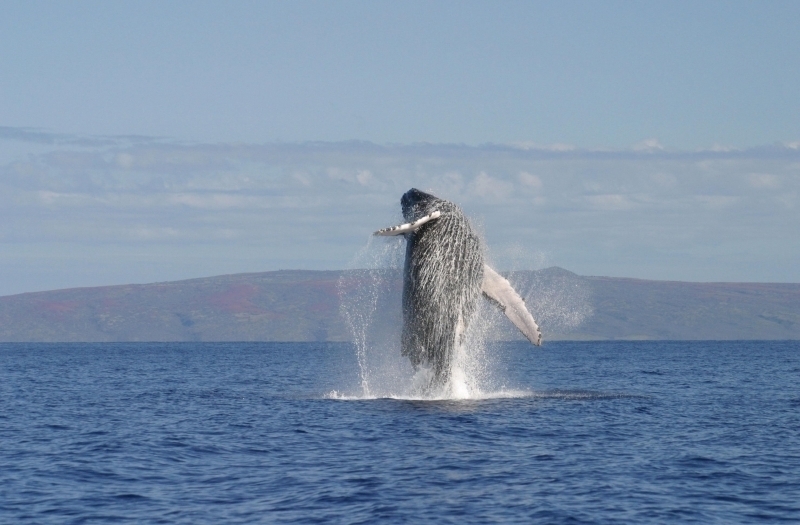 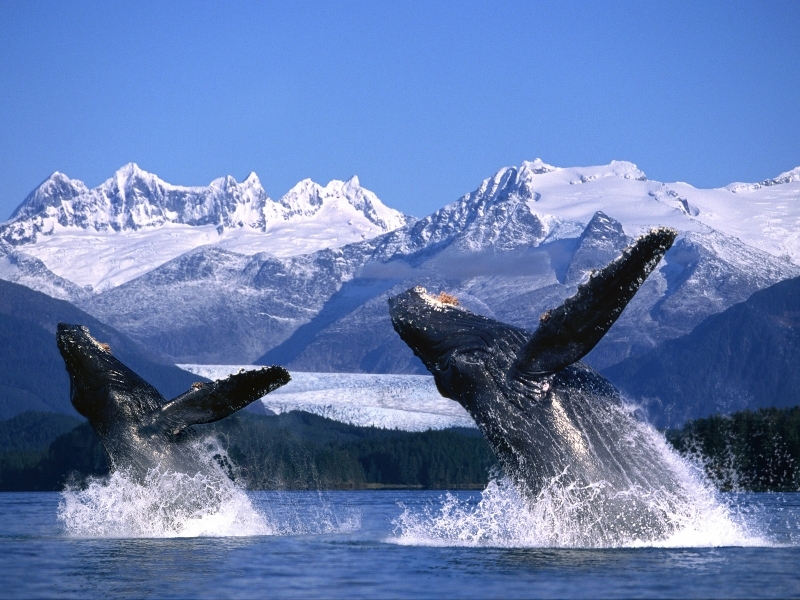 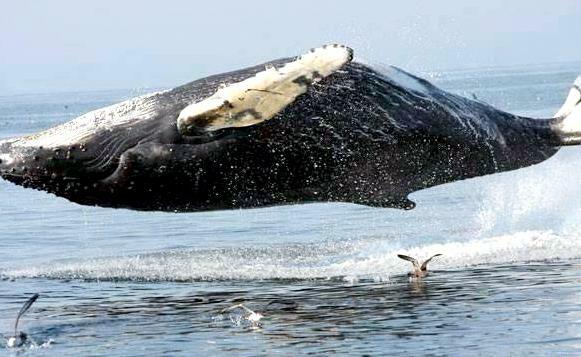 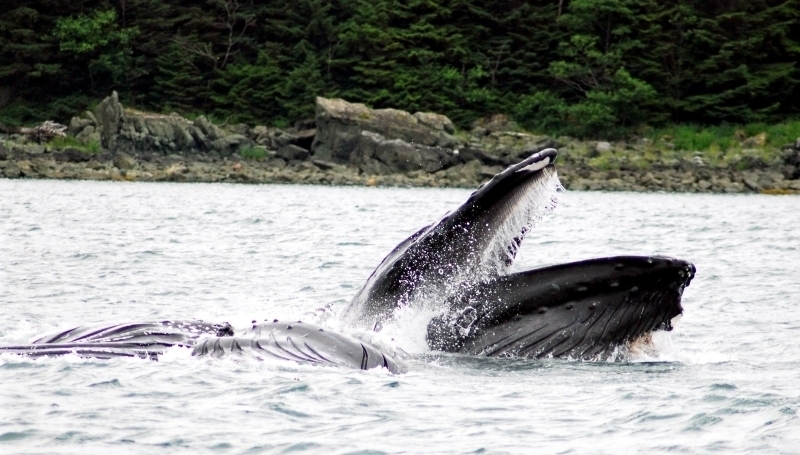 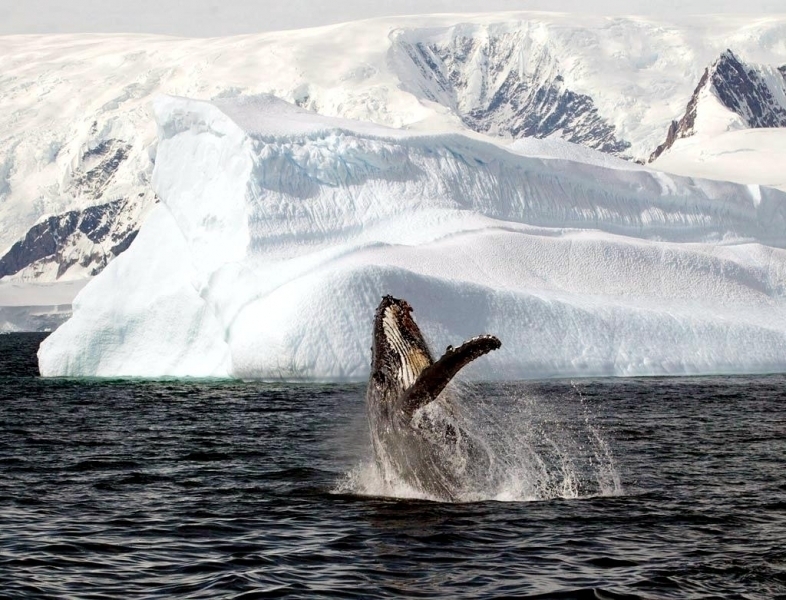 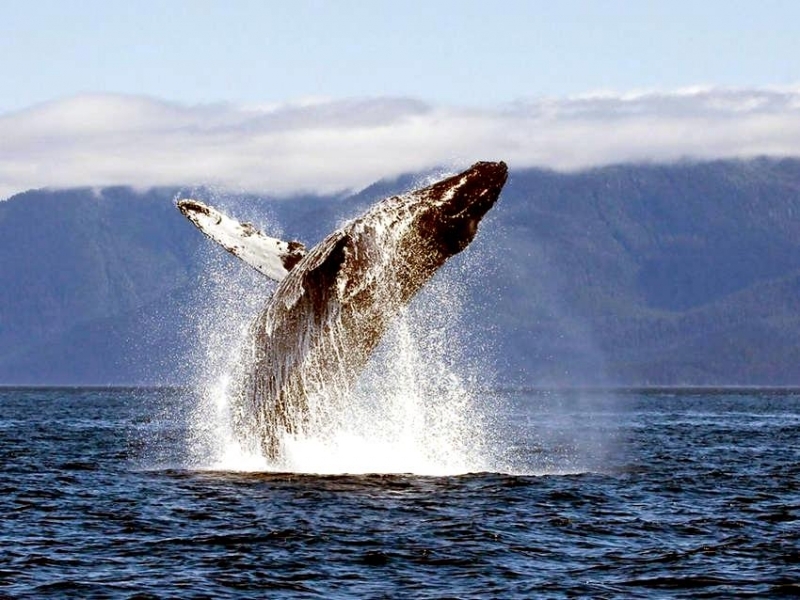 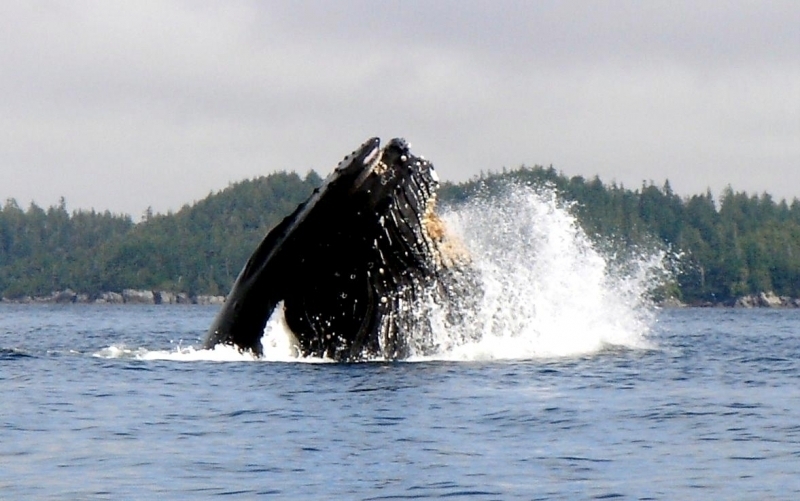 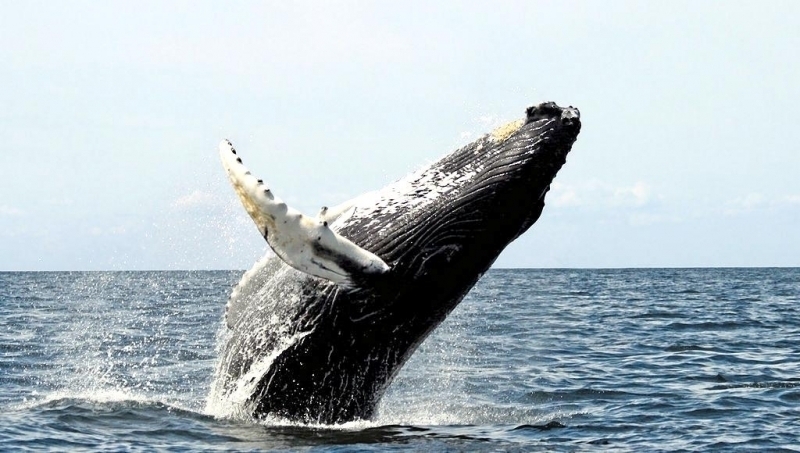 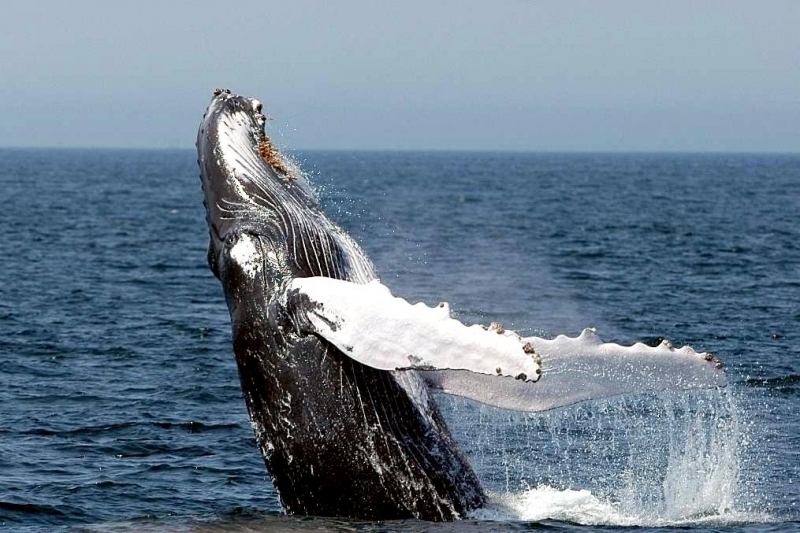 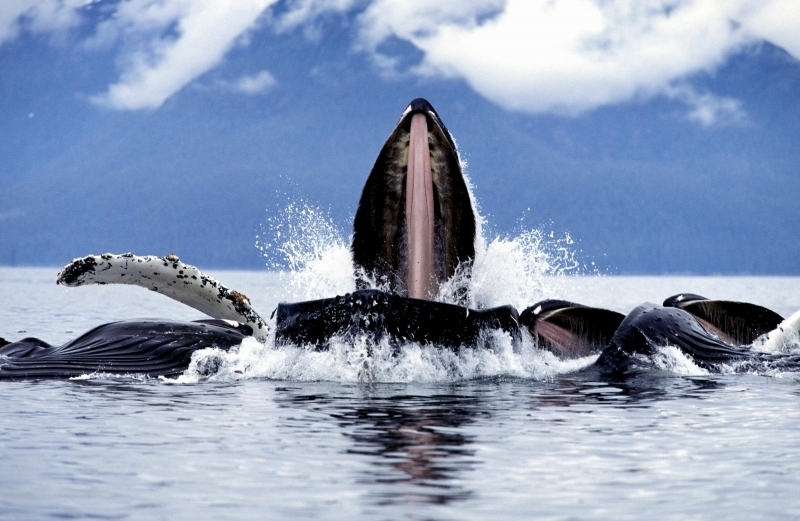 Humpback Whales are some of the acrobats of the ocean, breaching and slapping the water. 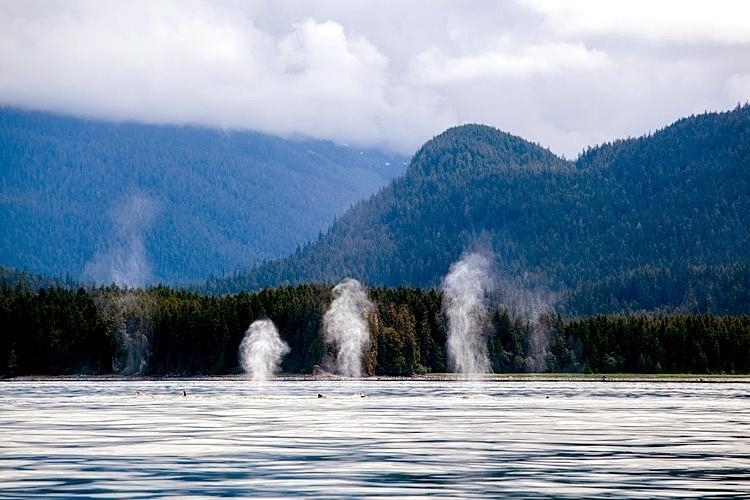 They live in pods and have 2 blowholes. 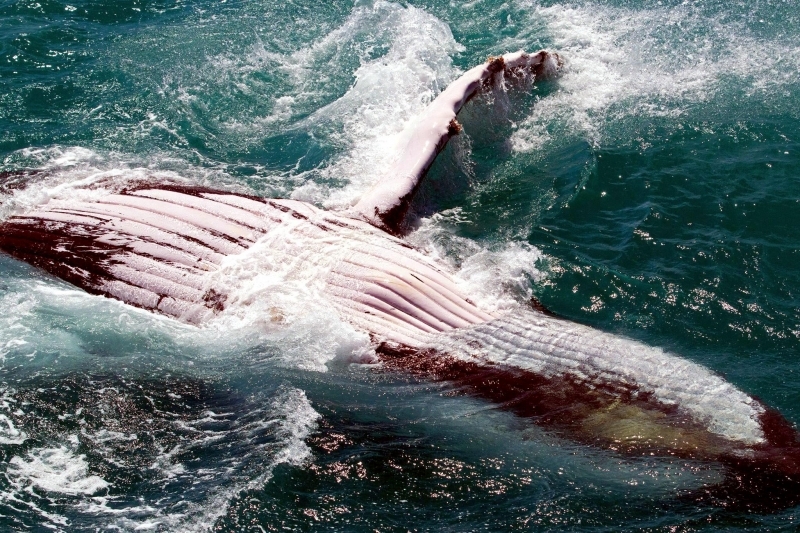 The name Humpback describes the motion it makes as it arches its back out of the water in preparation for a dive. 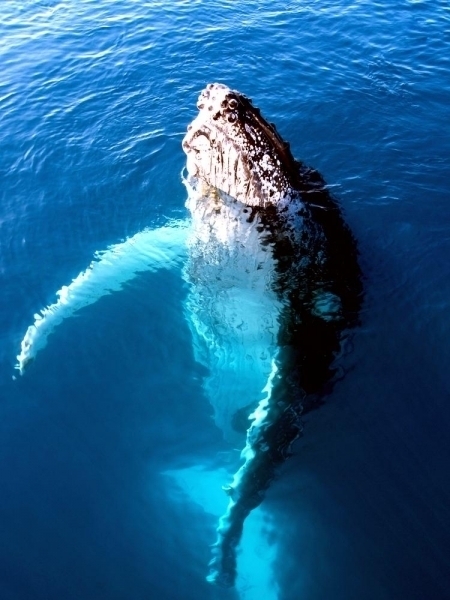 Humpback Whales grow to be about 52 feet long, weighing 30-50 tons. 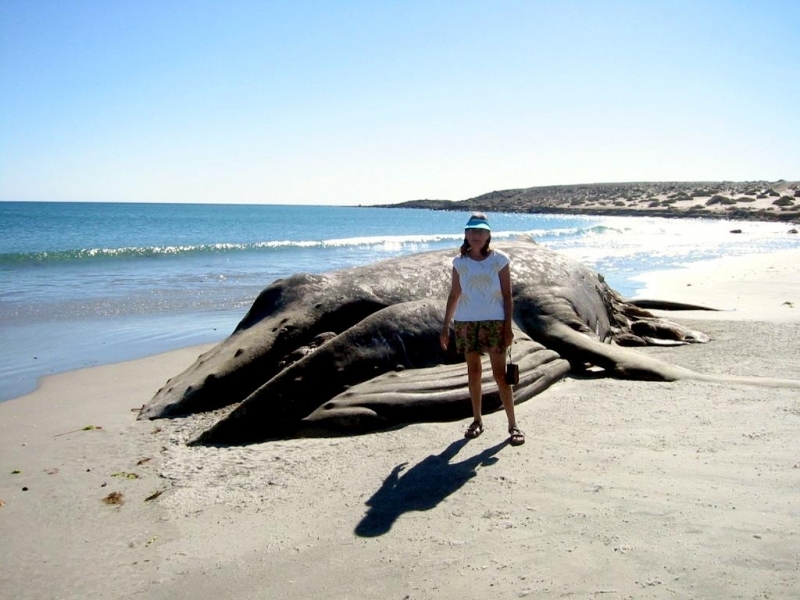 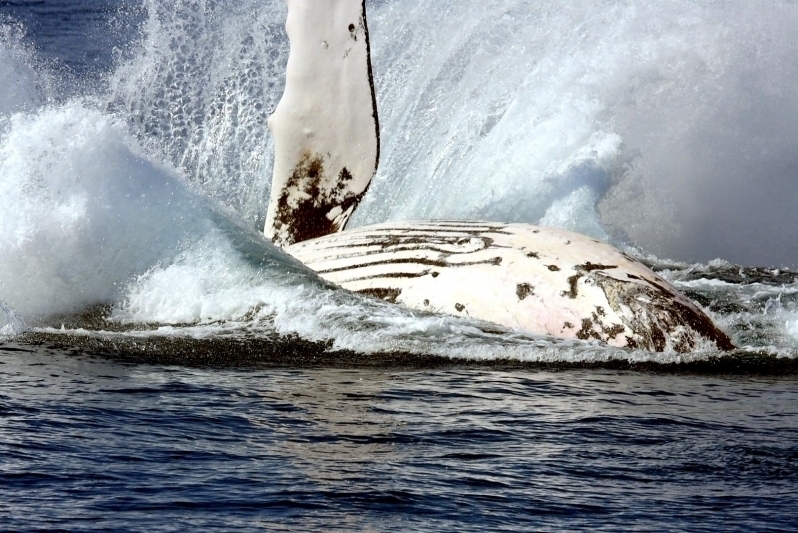 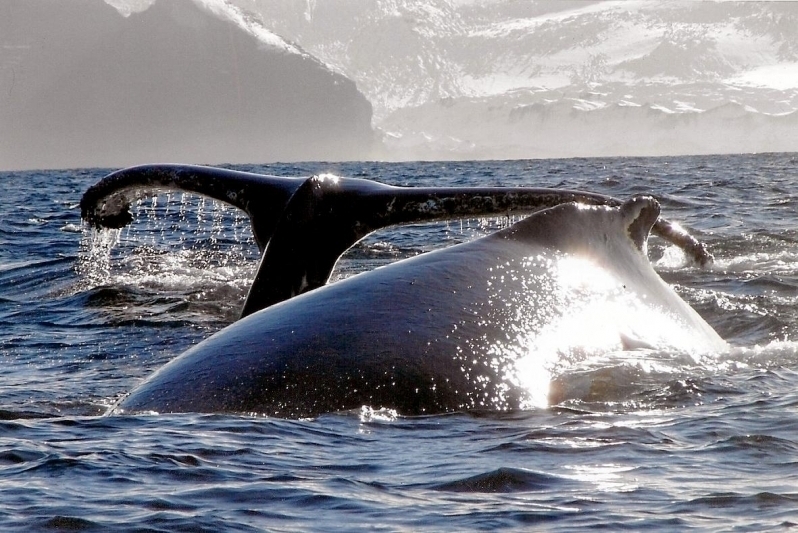 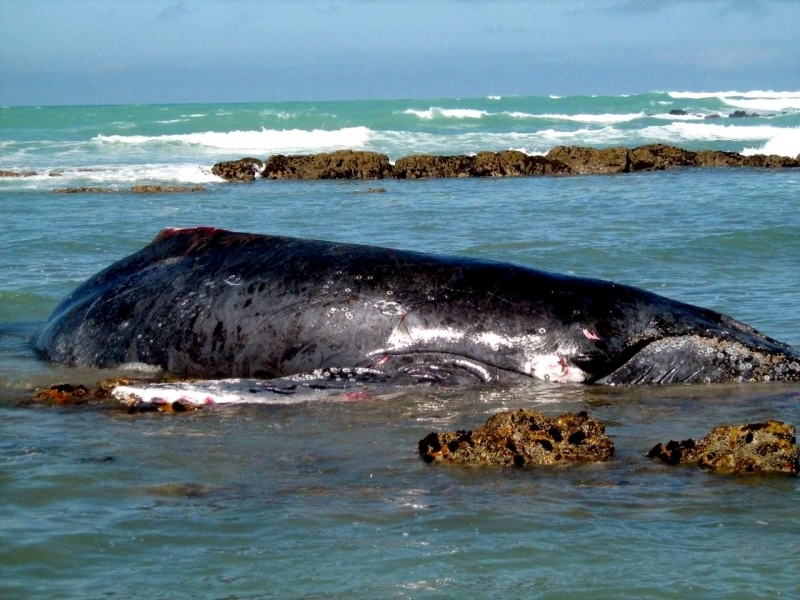 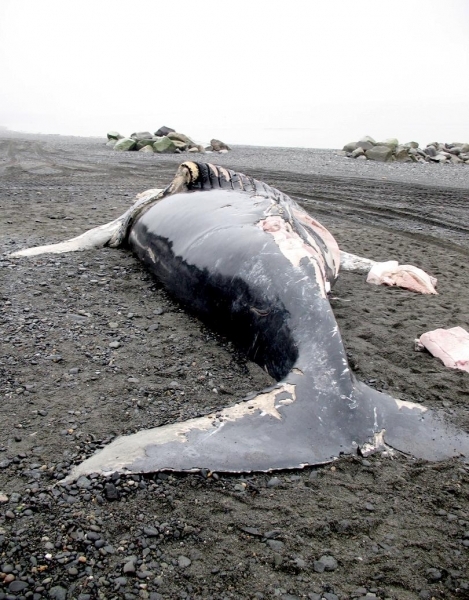 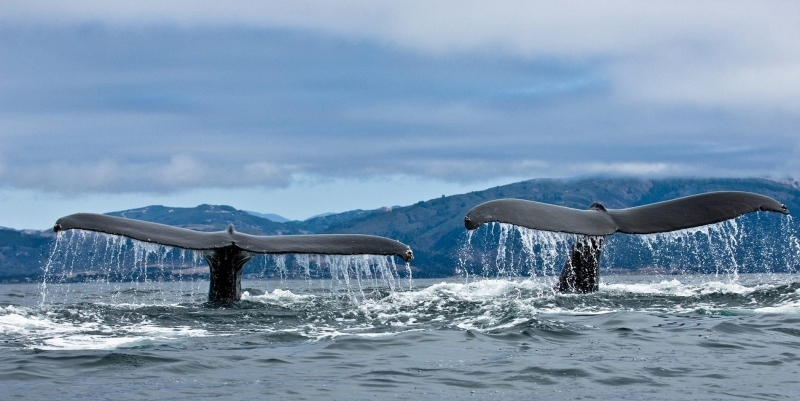 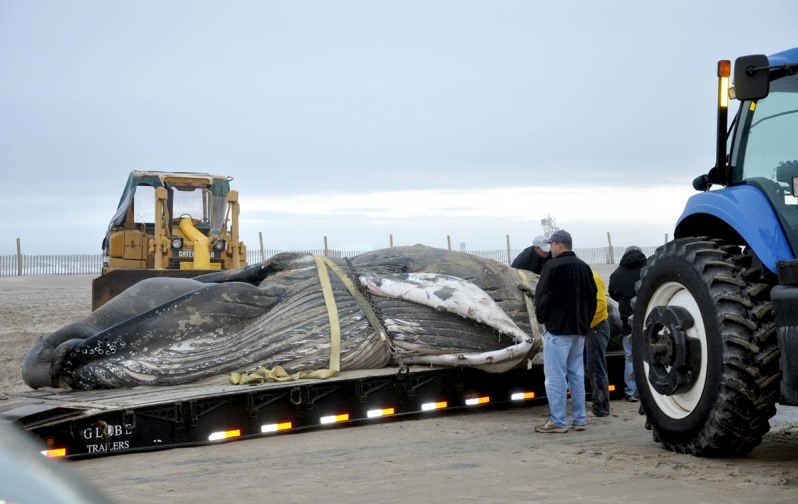 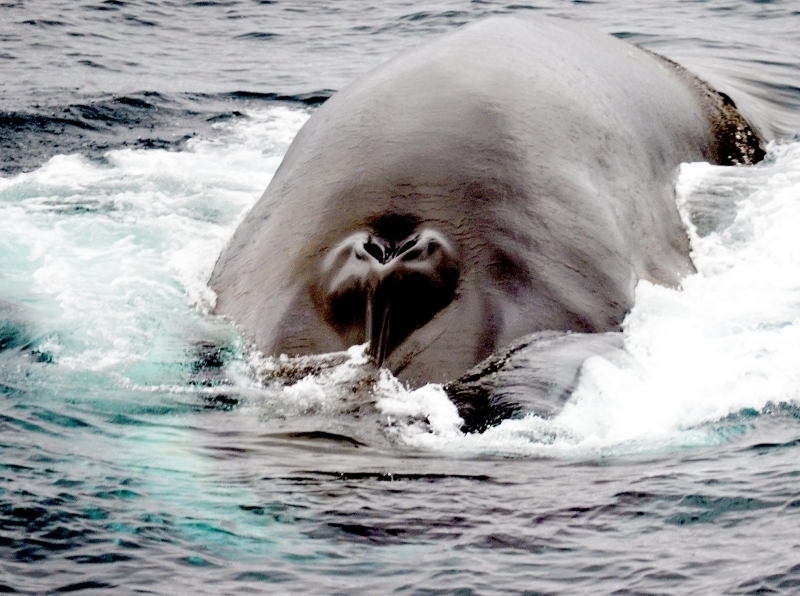 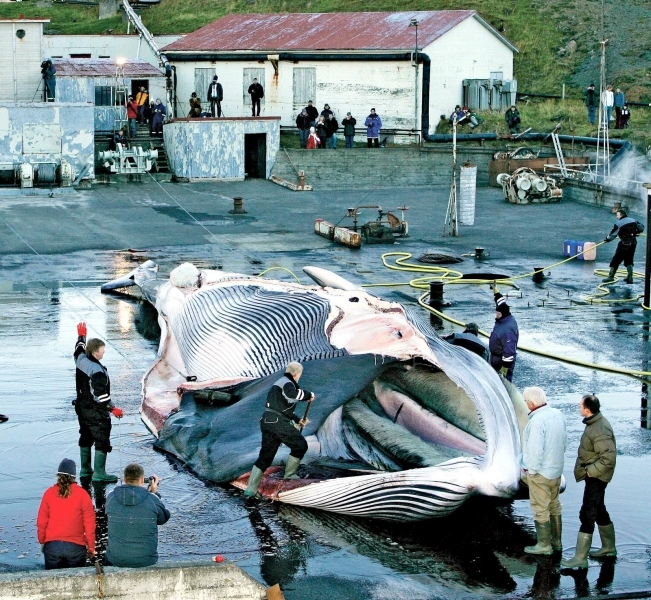 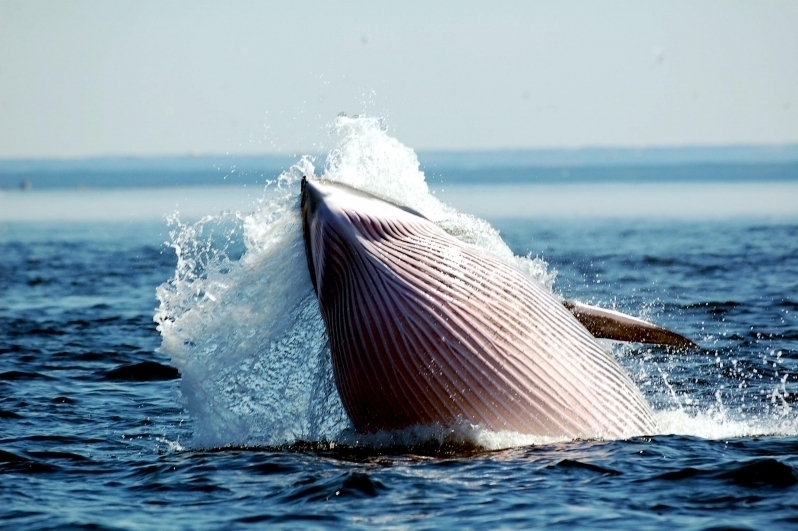 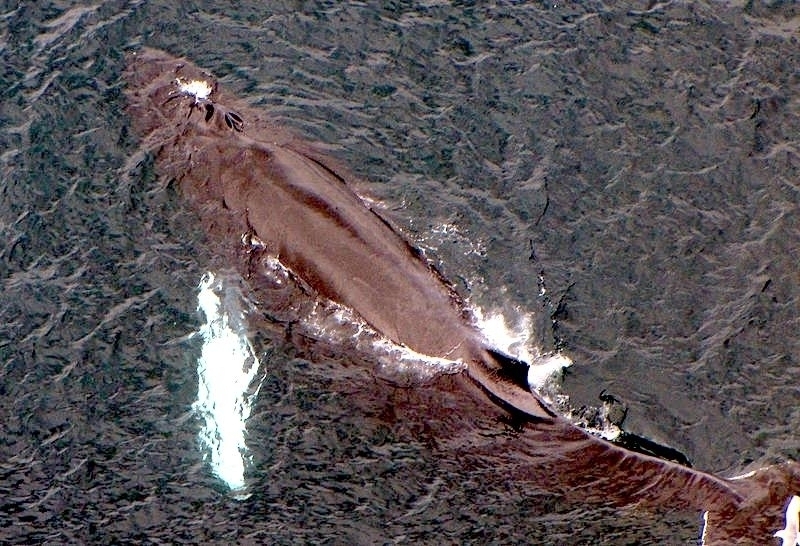 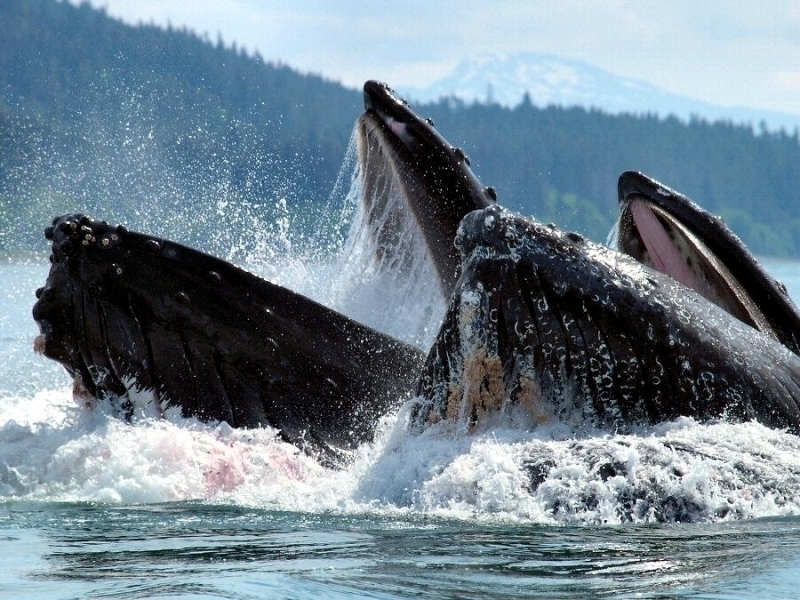 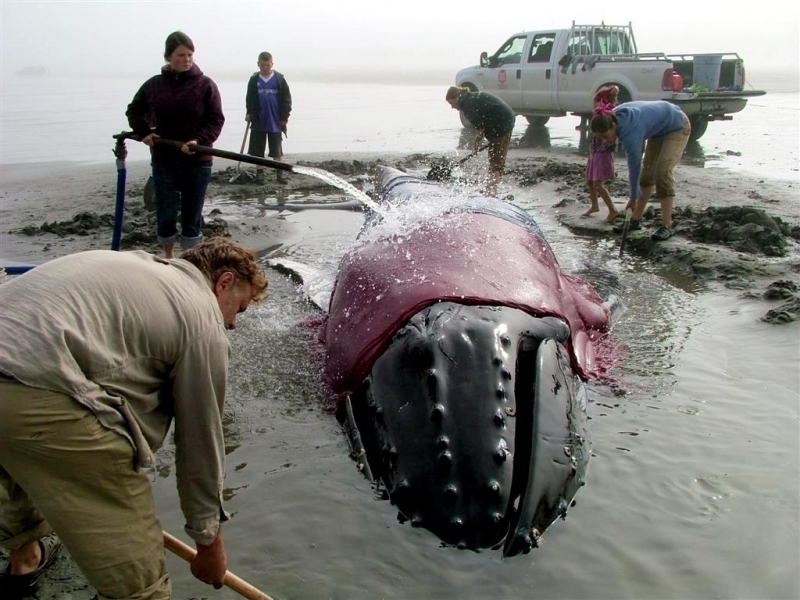 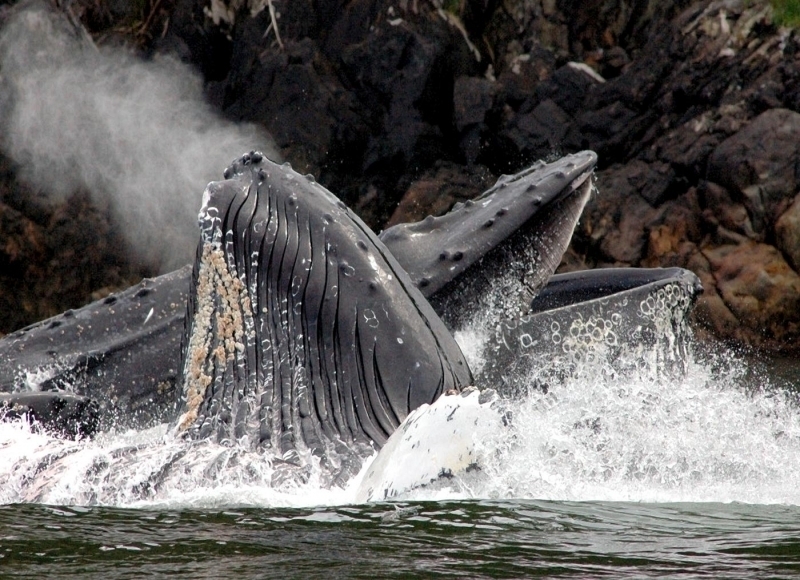 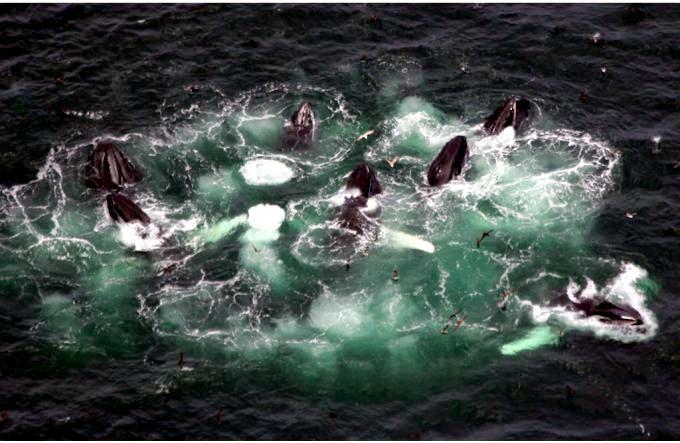 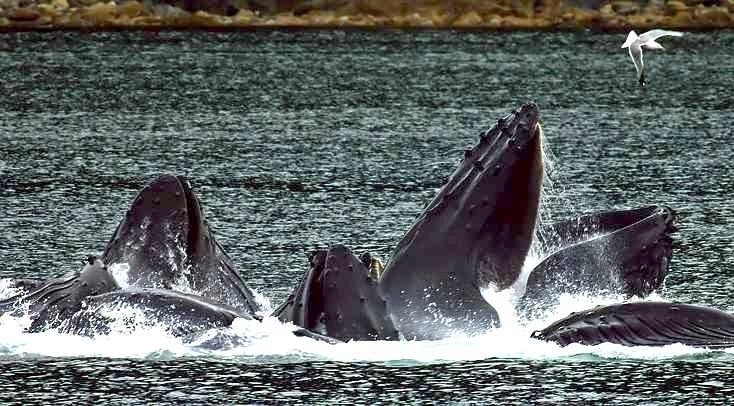 The females are slightly larger than males, as with all baleen whales. 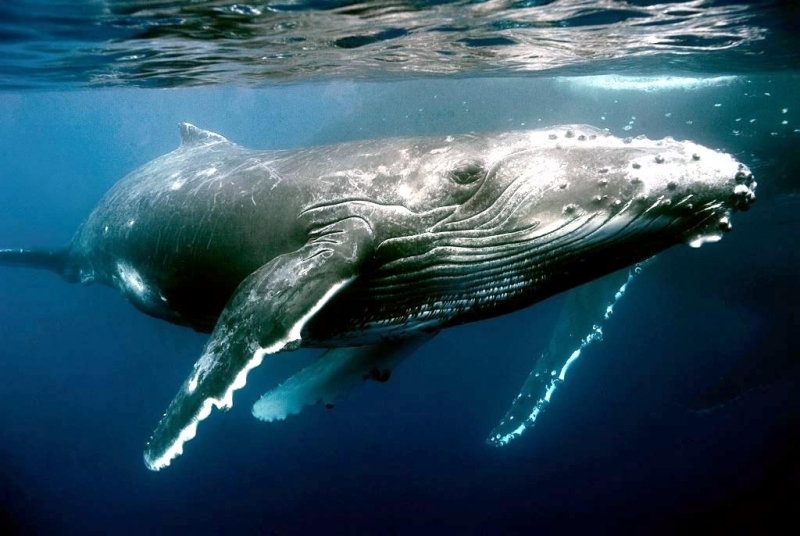 The 4-chambered heart of the average Humpback Whale weighs about 430 pounds, about as much as three average adult human beings. 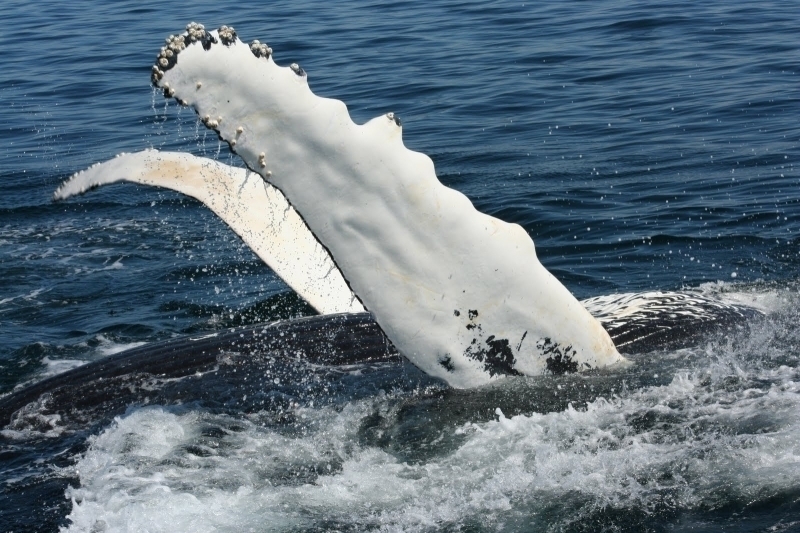 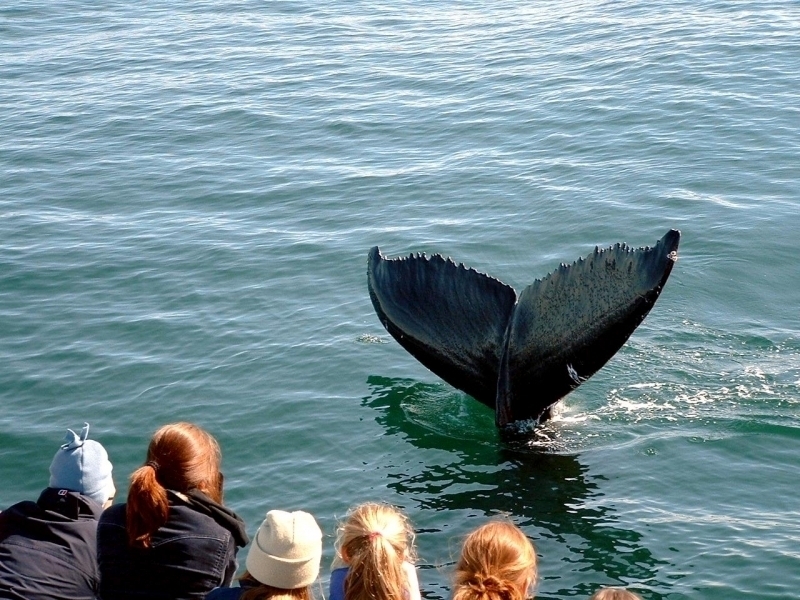 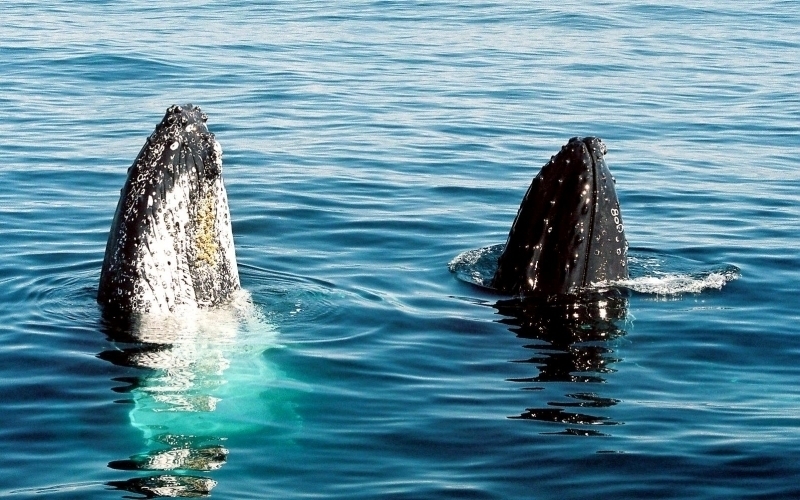 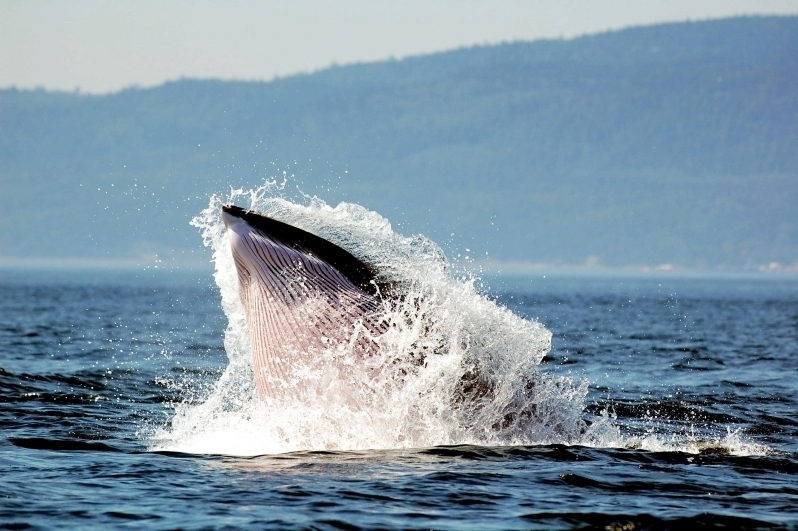 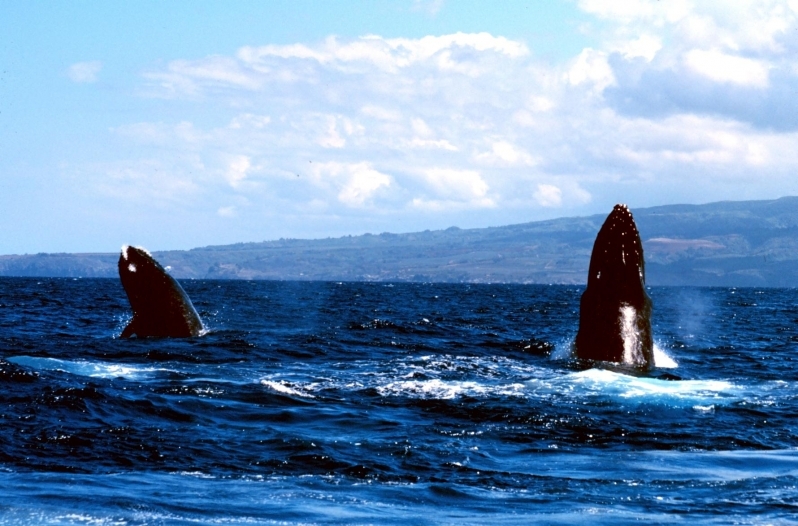 Humpbacks come in 4 different color schemes, ranging from white to gray to black to mottled. 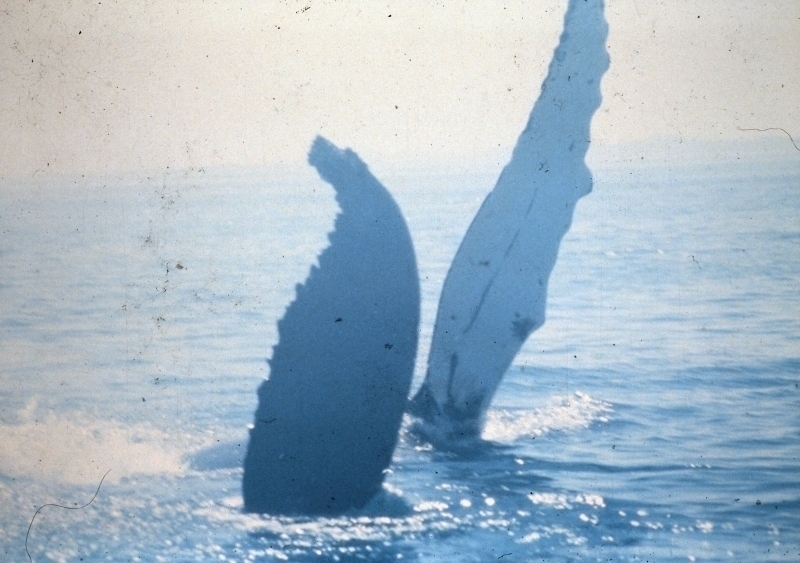 There are distinctive patches of white on underside of the flukes (tail). 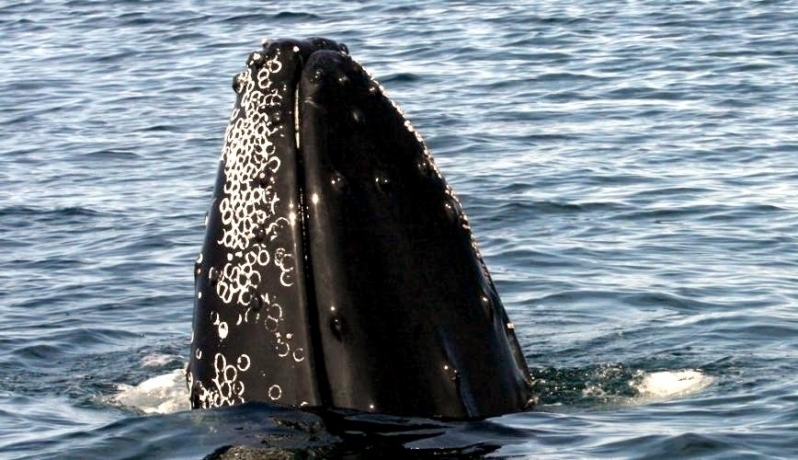 These markings are unique to each individual whale like a fingerprint. 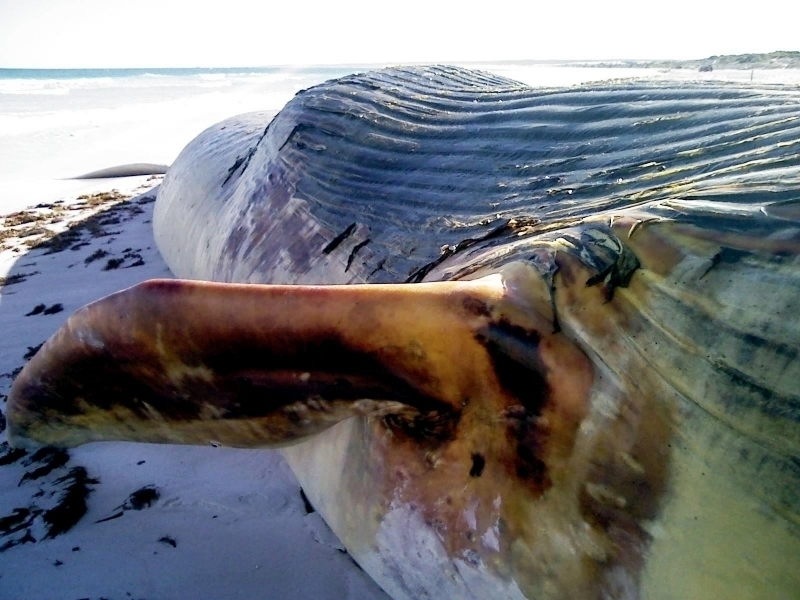 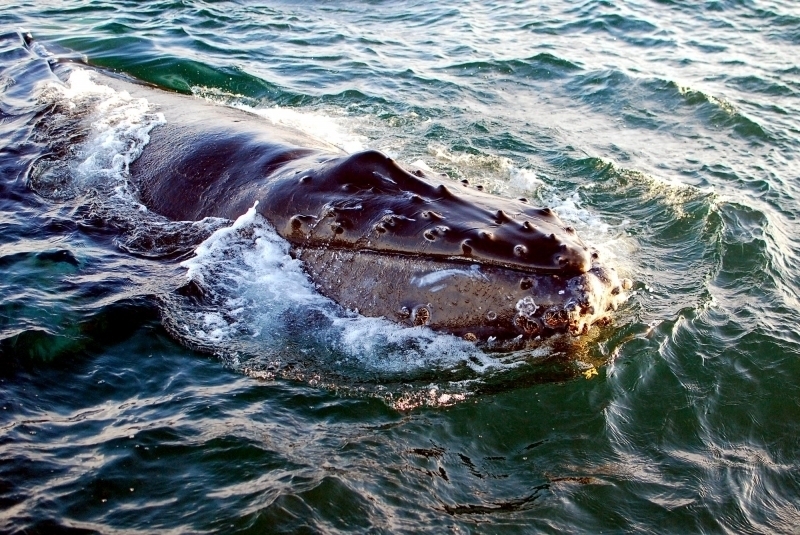 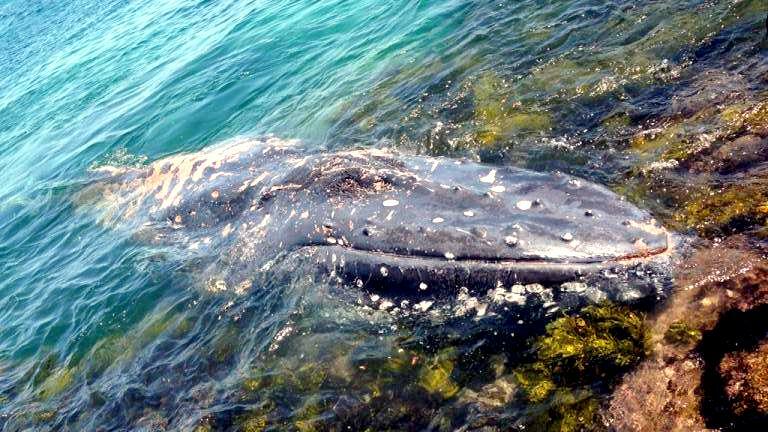 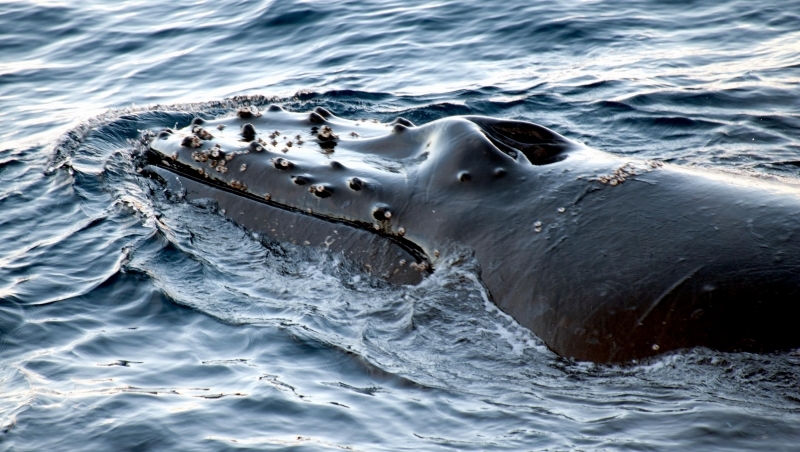 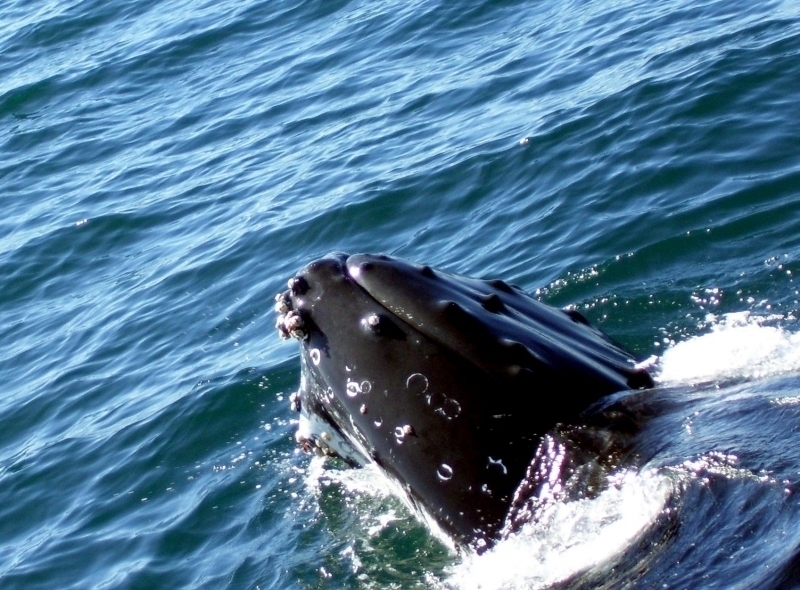 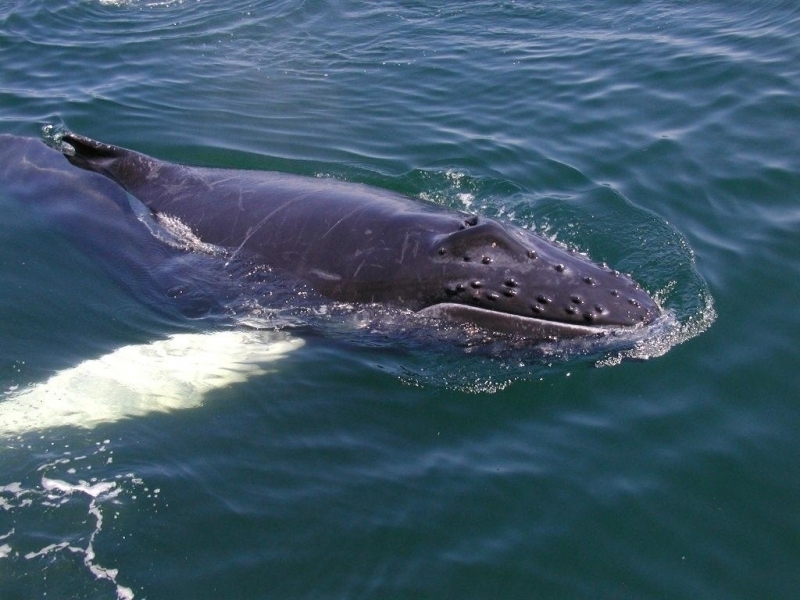 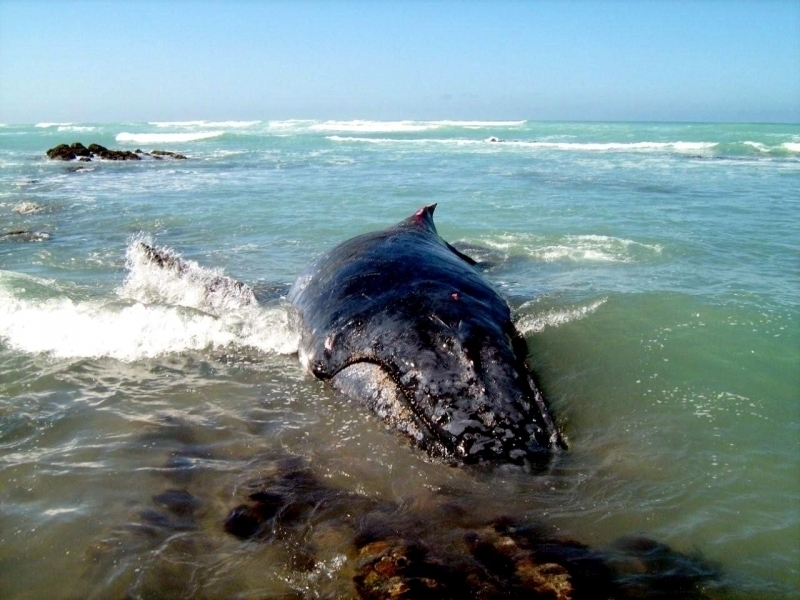 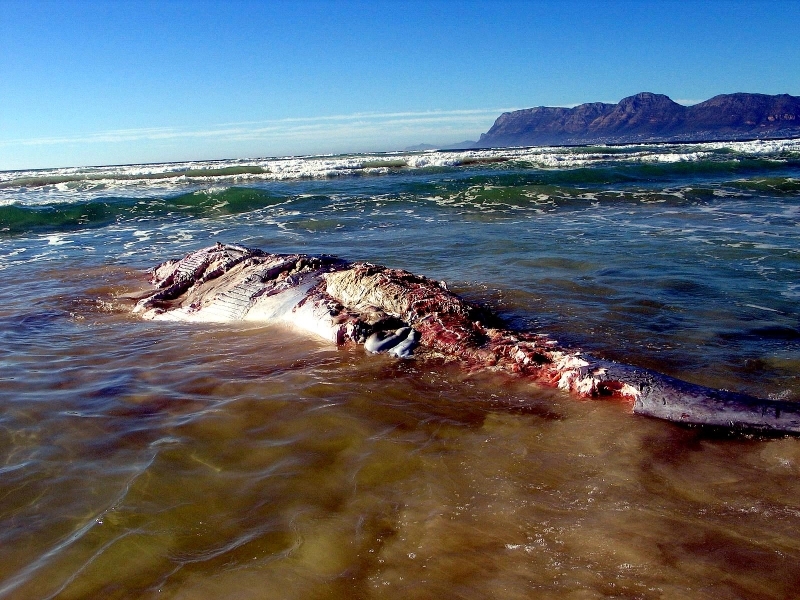 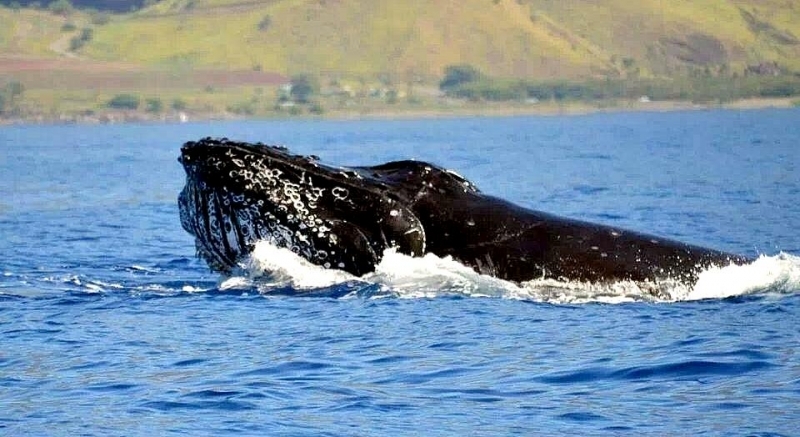 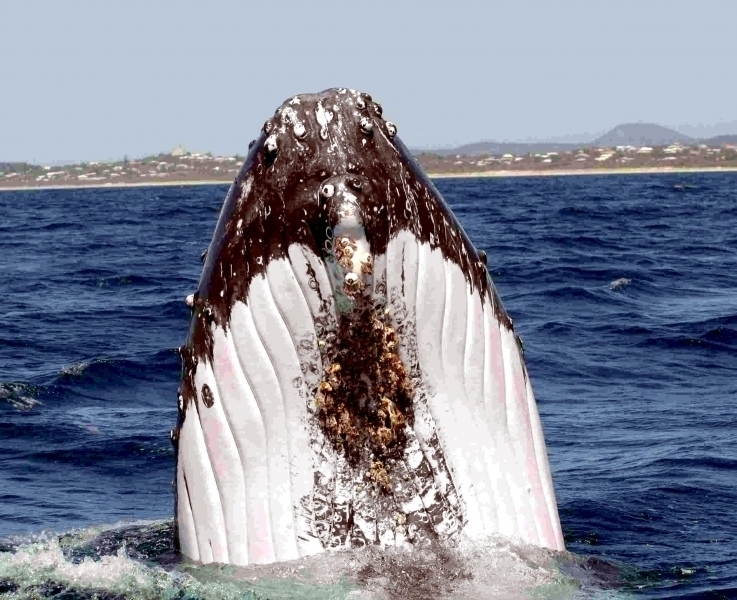 The Humpback’s skin is frequently scarred and may have patches covered with barnacles. 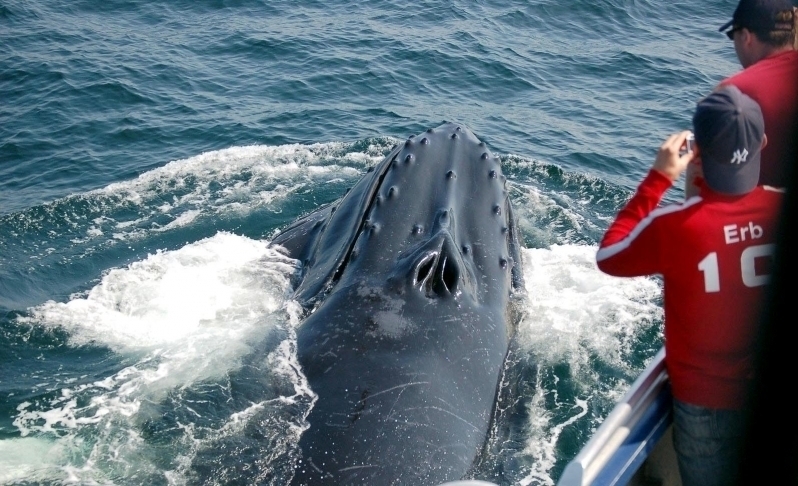 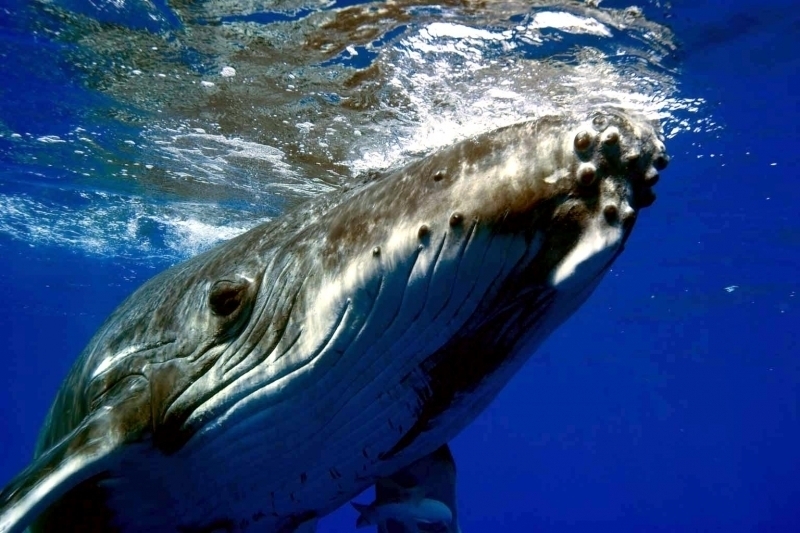 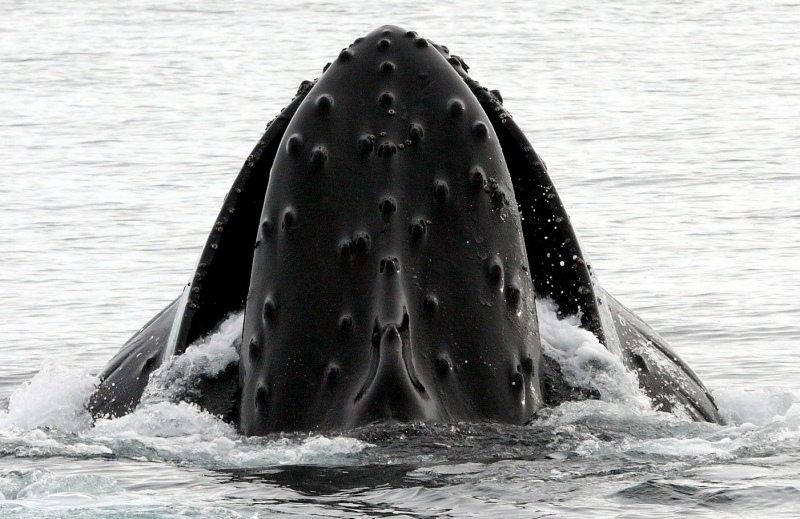 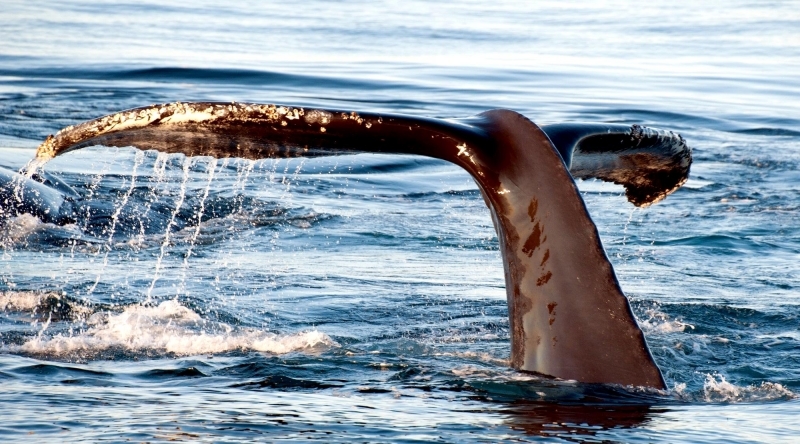 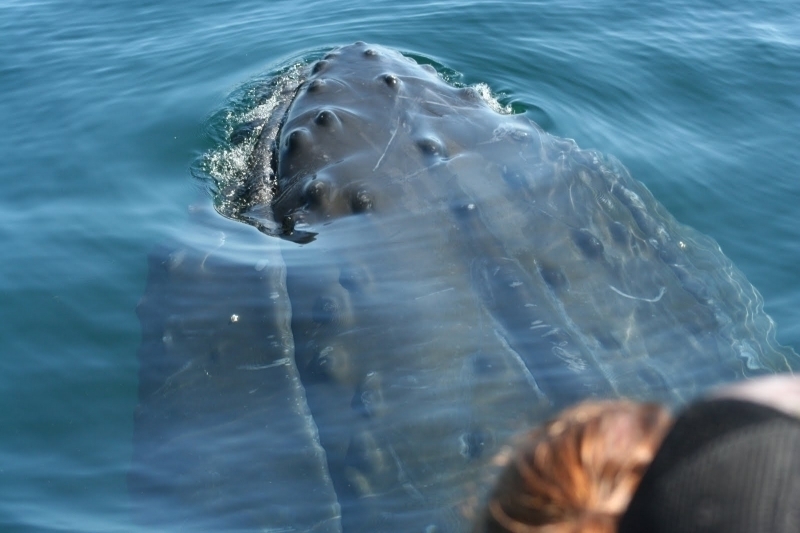 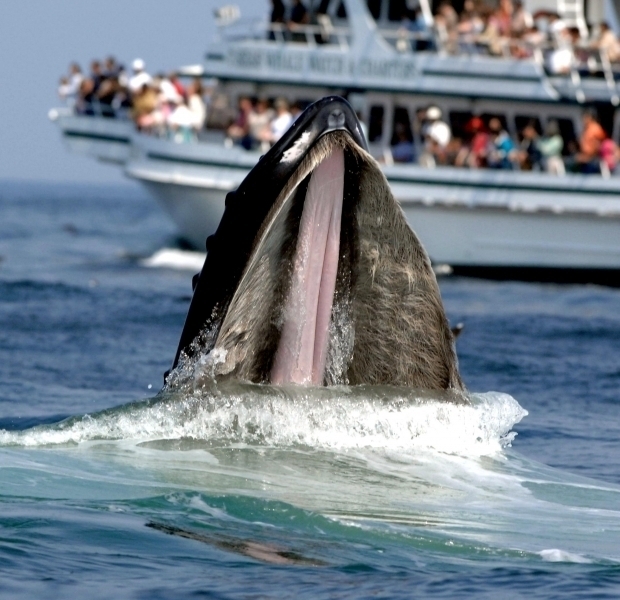 Humpback Whales have 14-35 throat grooves that run from the chin to the navel. 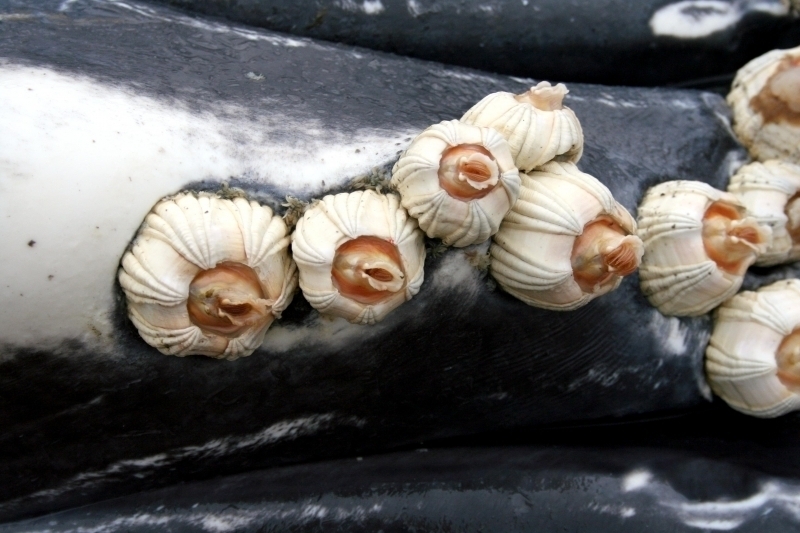 These grooves allow their throat to expand during the huge intake of water during filter feeding. 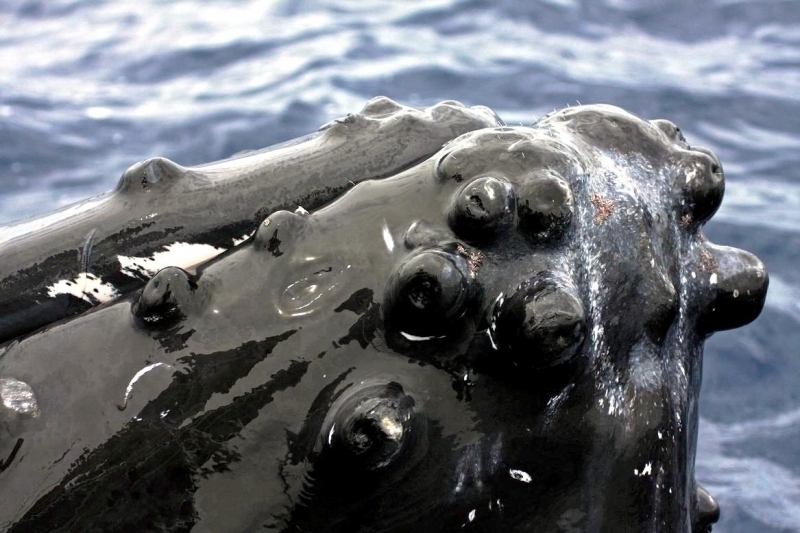 They have small, round bumps on the front of the head called knobs or tubercles edging the jaws. 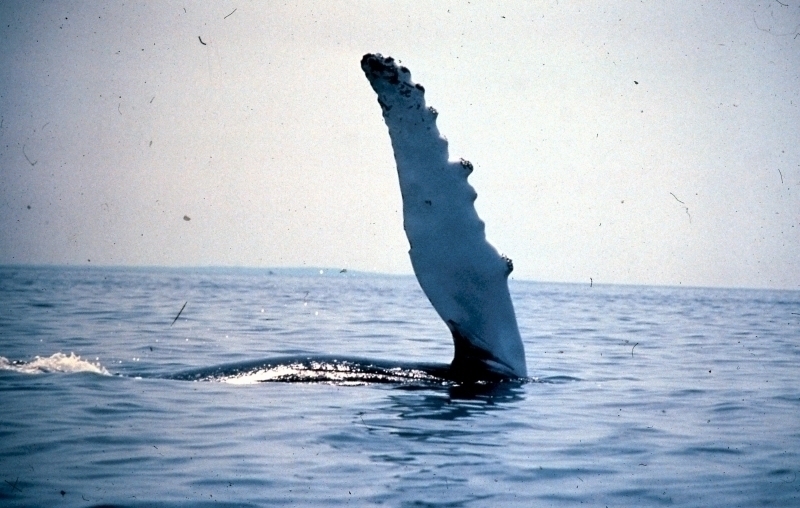 Humpbacks have huge, mottled white flippers with rough edges that are up to one-third of its body length; these are the largest flippers of any whale. 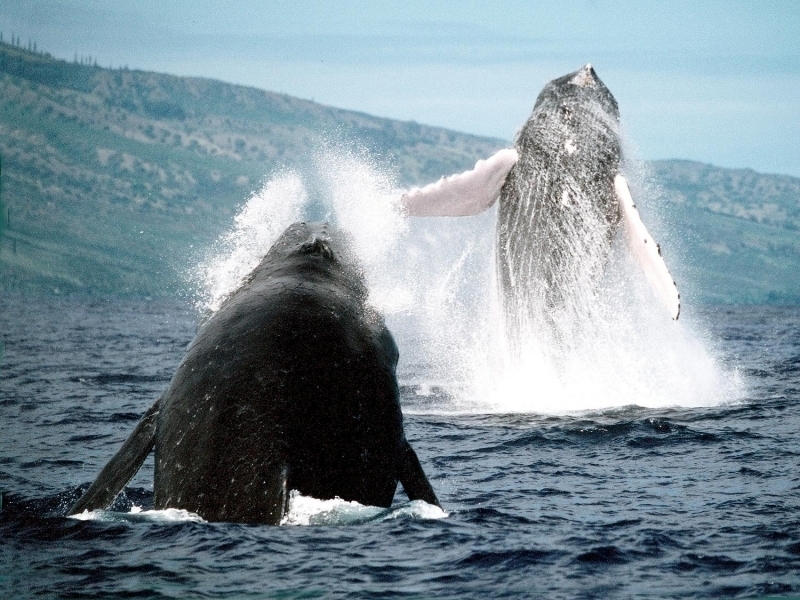 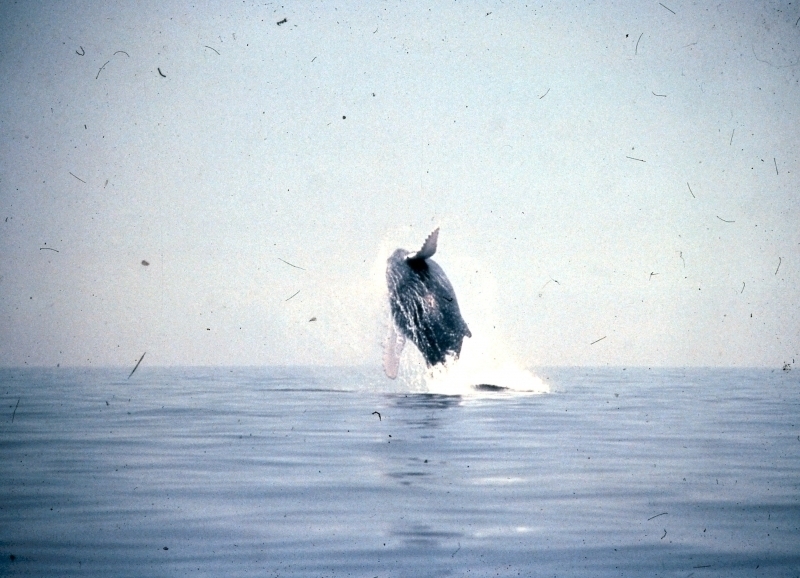 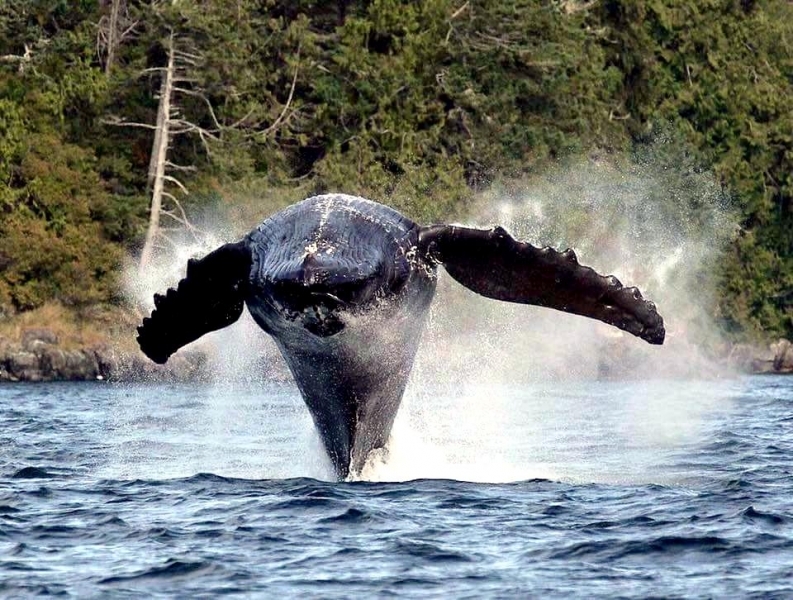 The Humpback’s genus Megaptera, means “huge-wings,” referring to its flippers. 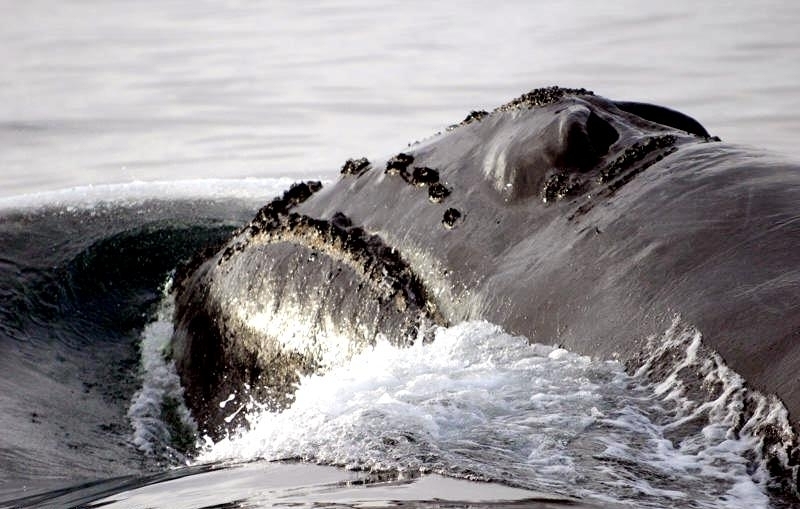 The flippers may have barnacles growing on them. 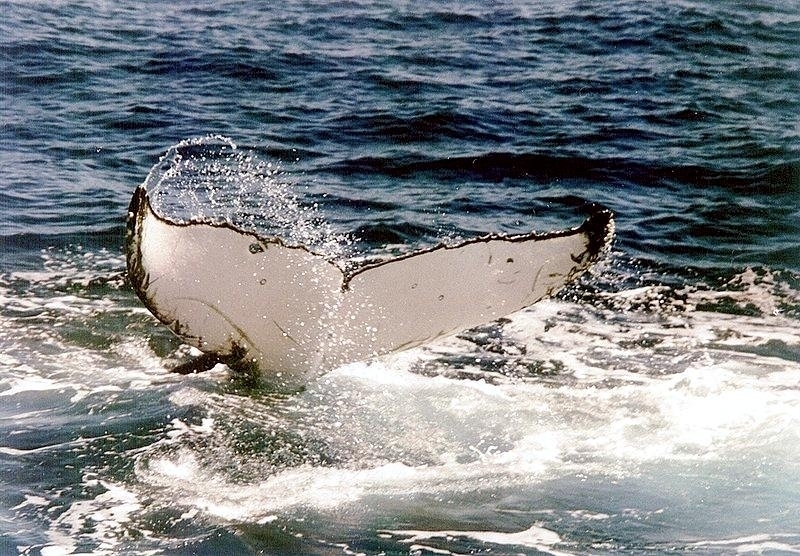 The deeply-notched tail flukes are up to 12 feet wide. 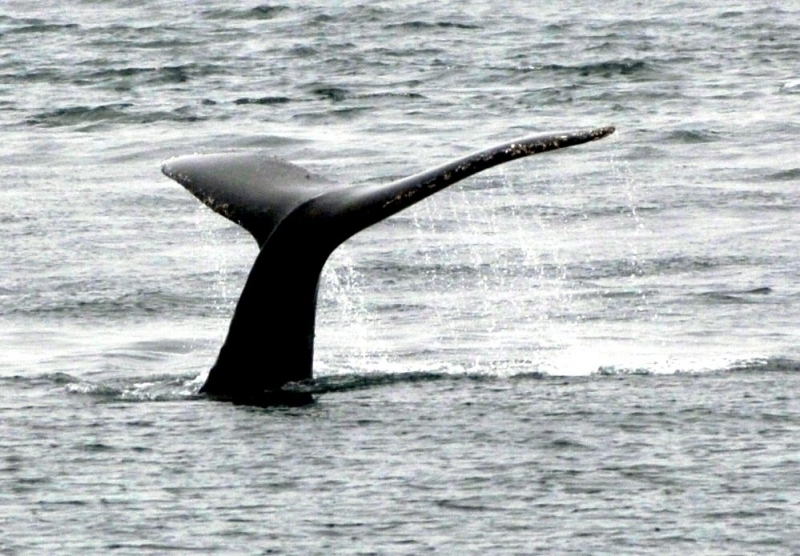 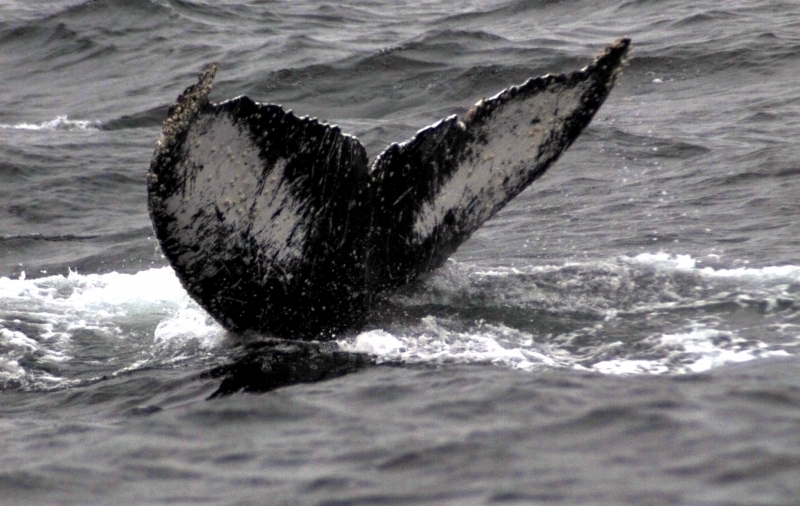 Humpbacks have a small dorsal fin toward the flukes. 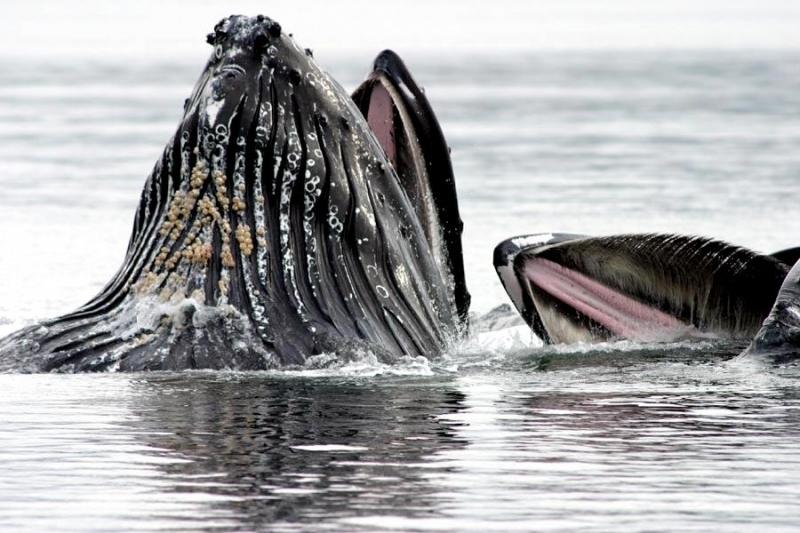 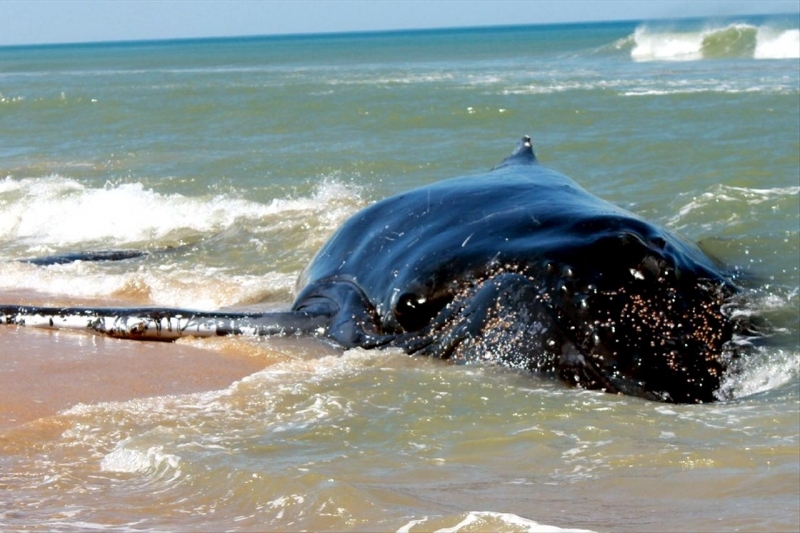 Humpback Whales like all baleen whales, are seasonal feeders and carnivores that filter feed tiny crustaceans called krill, mainly copepods, plankton and small fish including Herring, Mackerel, Capelin and Sandeel from the water. 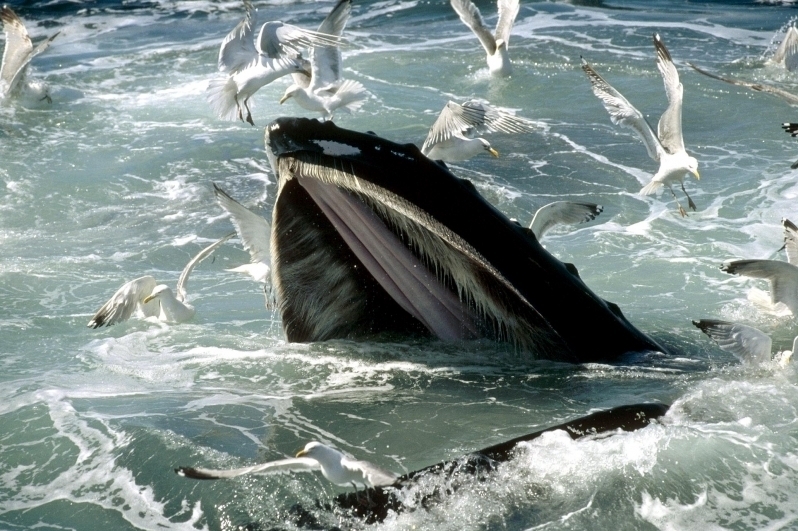 They are gulpers not skimmers, filter feeders that alternatively swim than gulp a mouthful of plankton or fish. 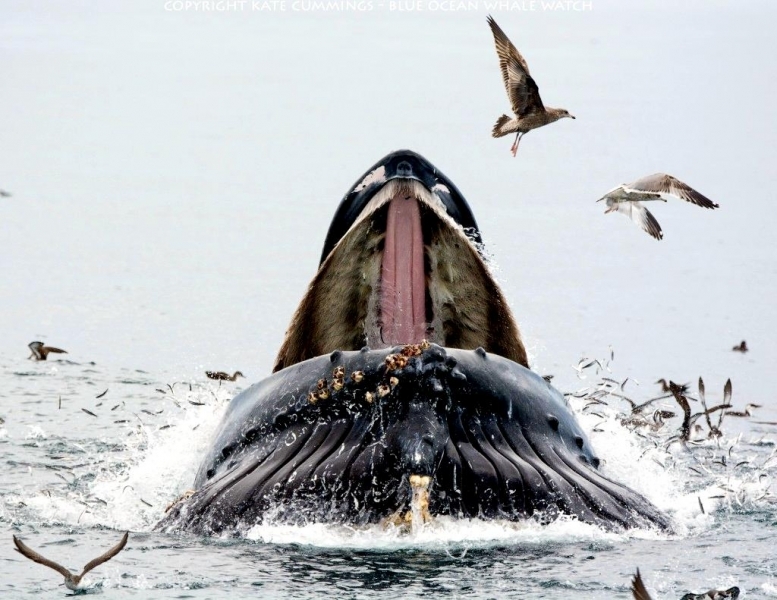 Concentrated masses of prey are preferable for this method of feeding. 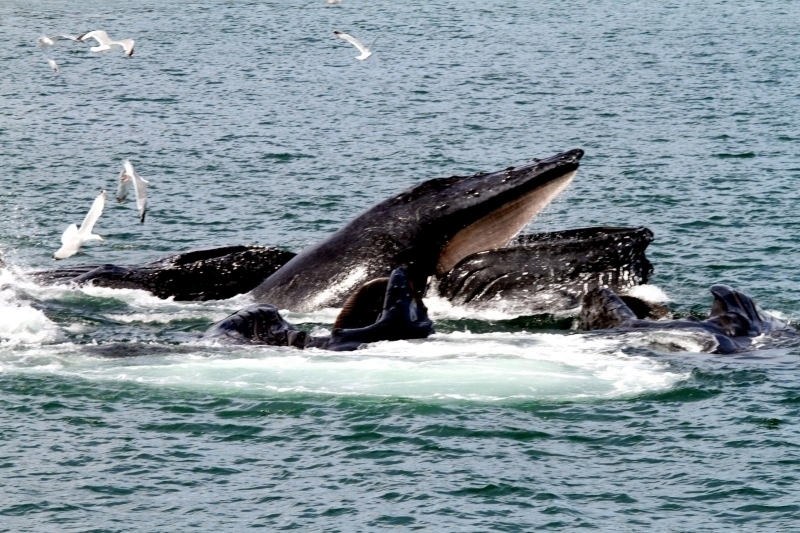 An average-sized Humpback Whale will eat 4,400-5,500 pounds of plankton, krill and small schooling fish each day during the feeding season in cold waters. 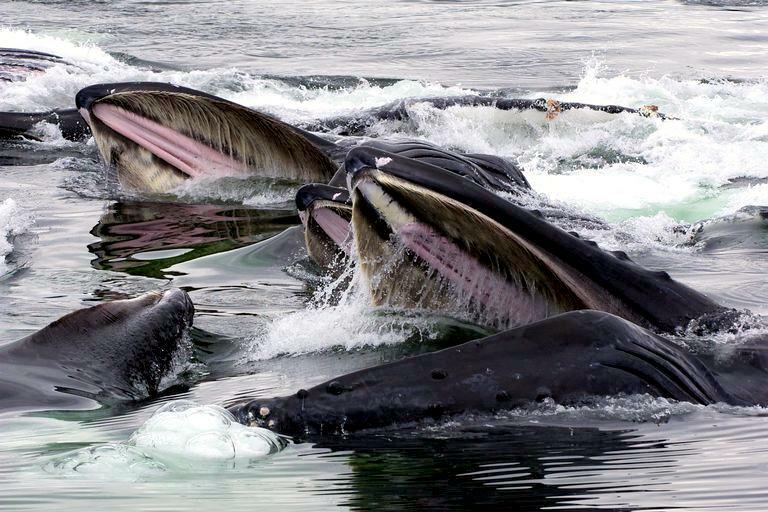 They eat twice a day. 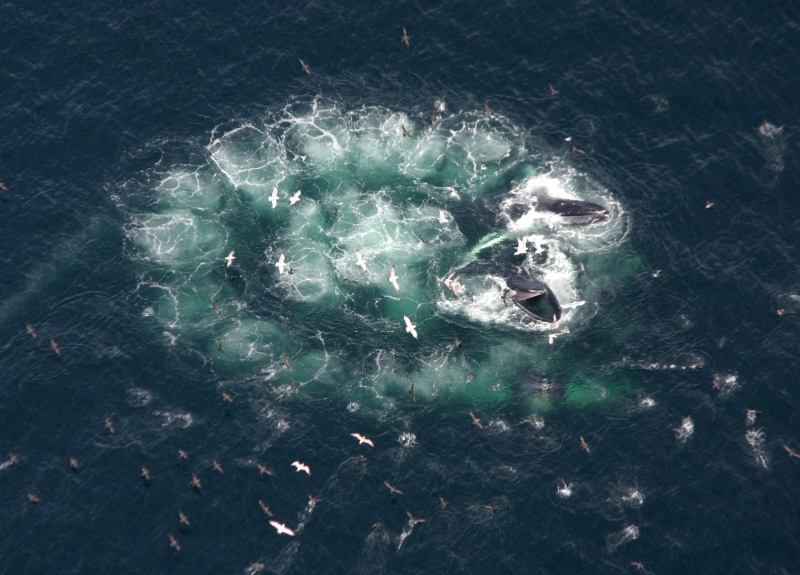 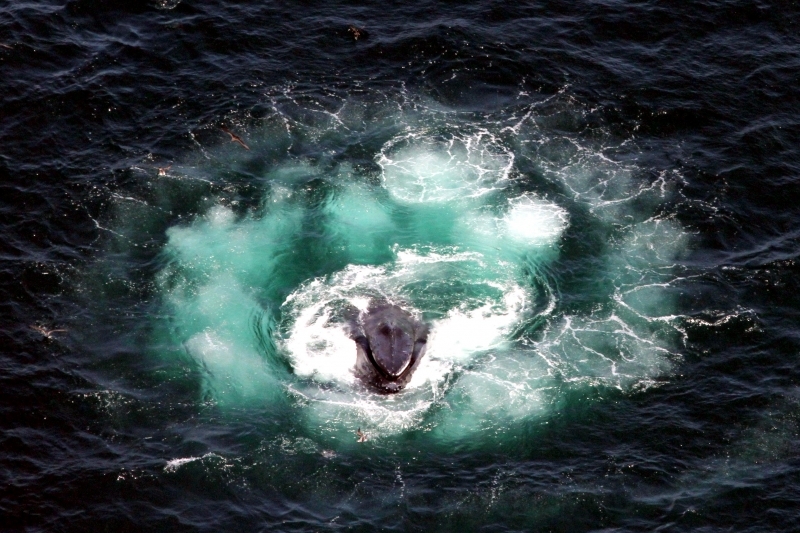 Humpbacks cooperate in hunting and have developed a method of rounding up highly concentrated masses of prey that is called bubble-net feeding. 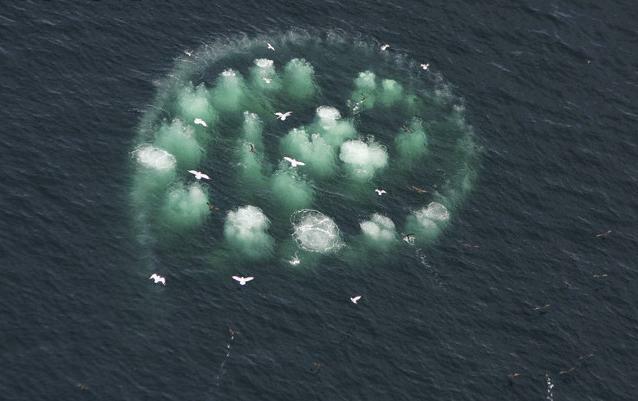 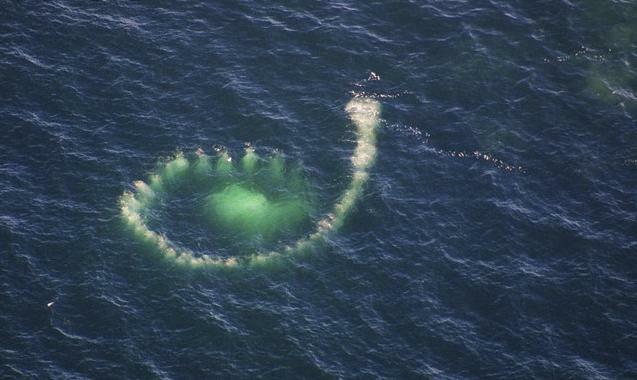 The hunting members of a pod form a circle 10 to 100 feet across and about 50 feet under the water. 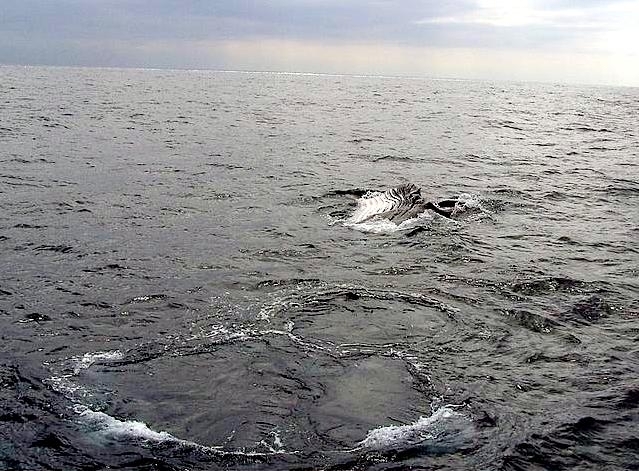 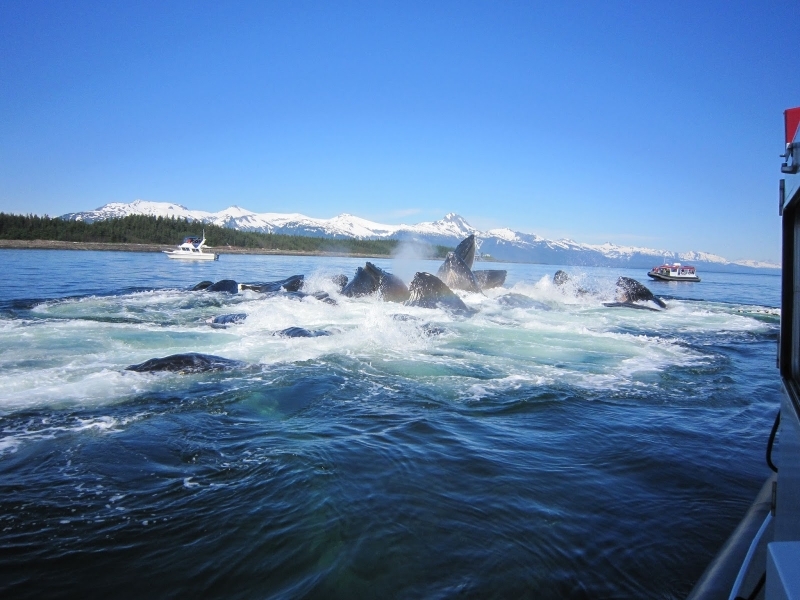 Then the Humpbacks blow a wall of bubbles as they swim to the surface in a spiral path. 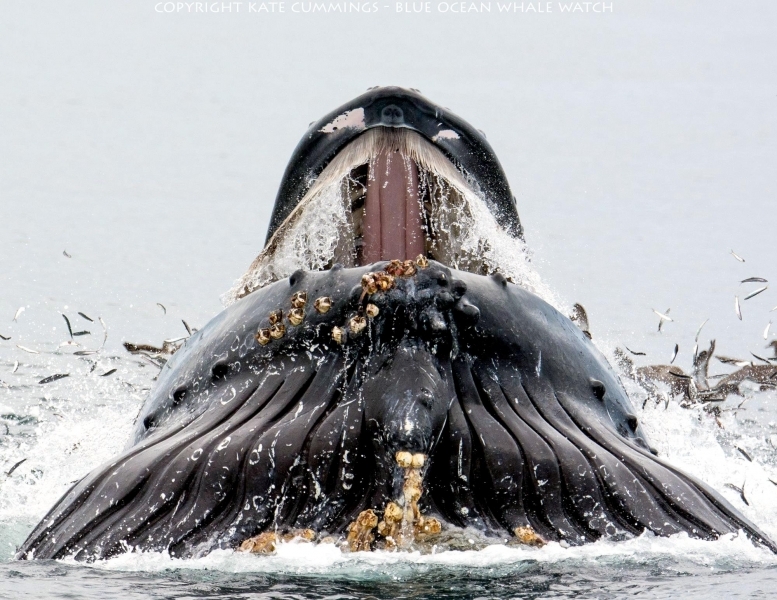 The cylindrical wall of bubbles makes the trapped krill, plankton or small fish move to the surface of the water in a giant, concentrated mass. 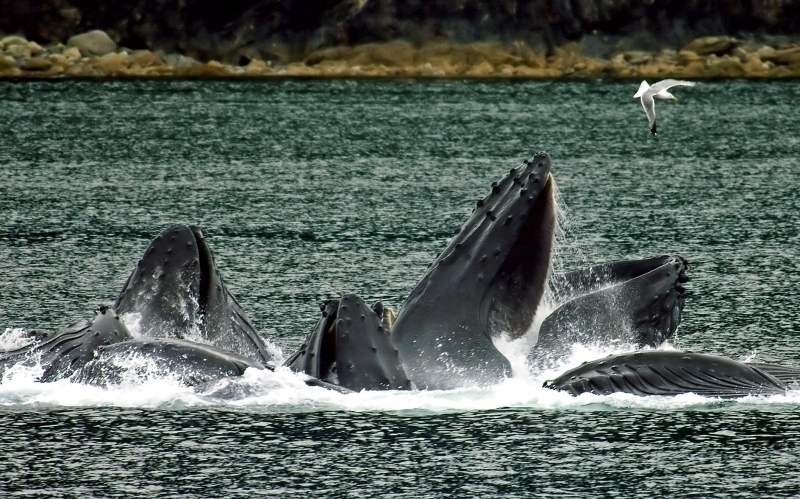 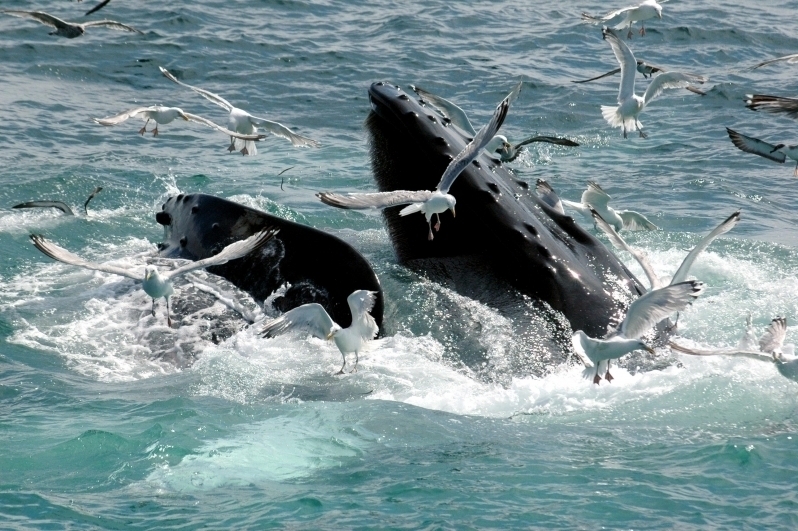 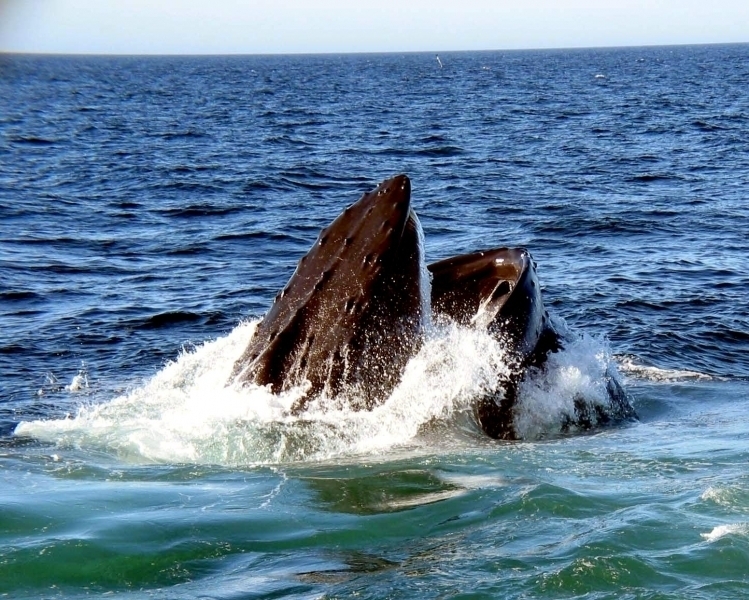 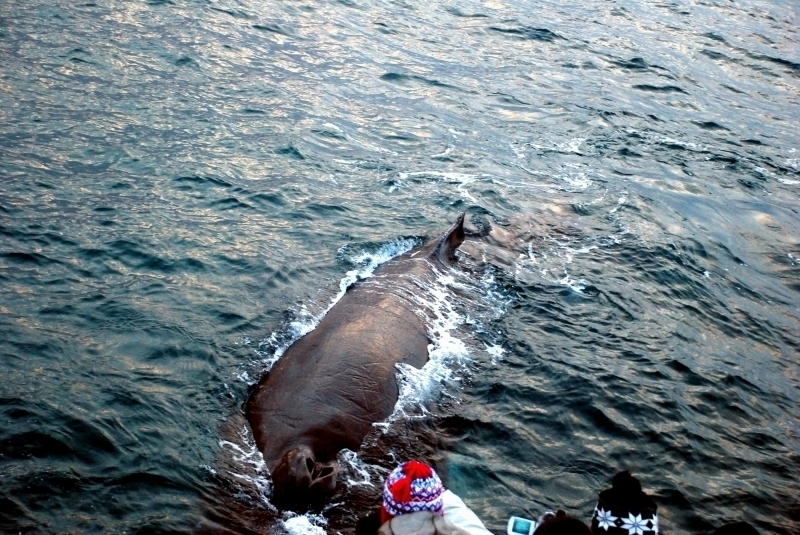 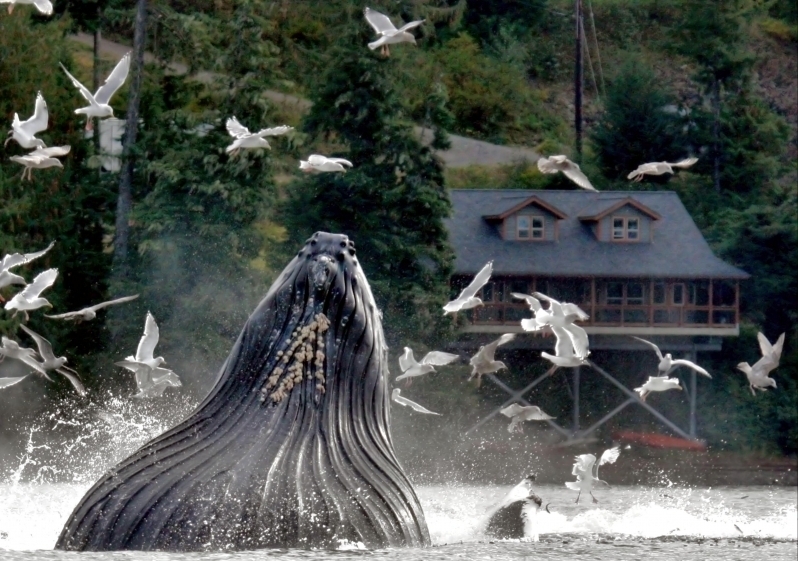 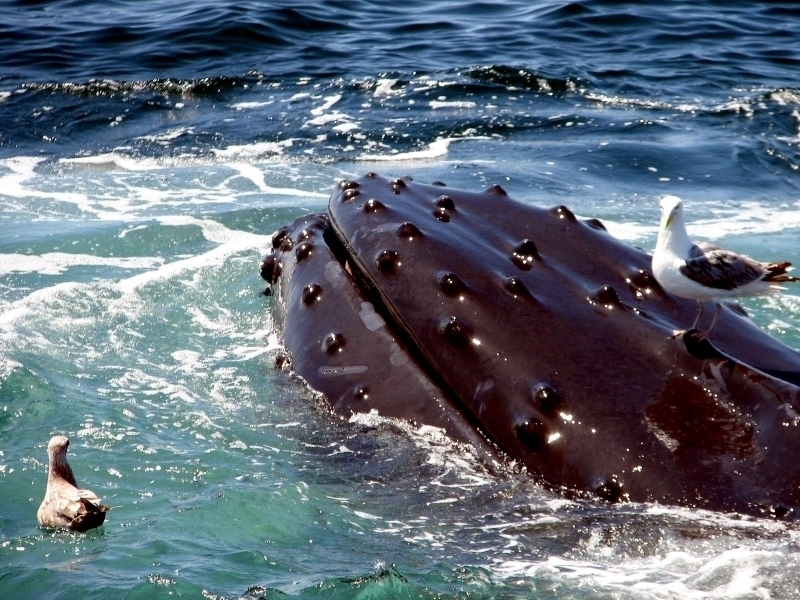 The Humpbacks then eat a large, hearty meal. 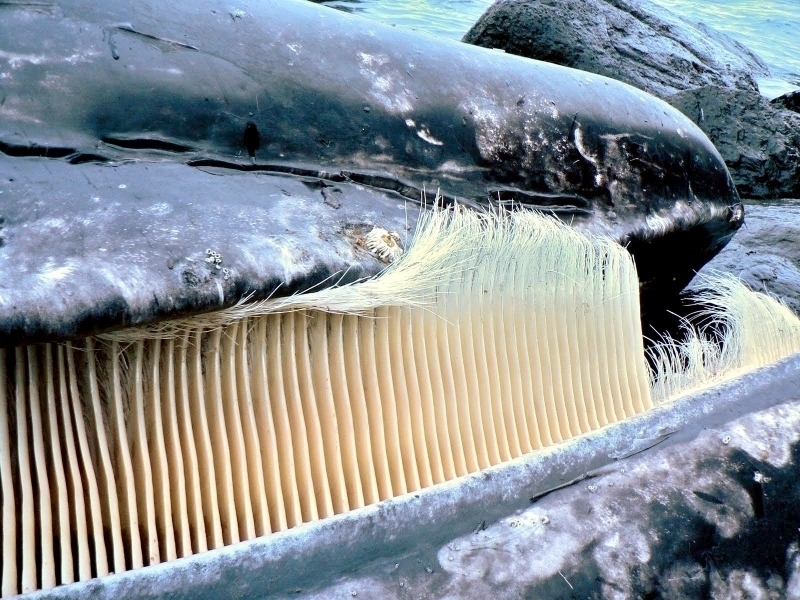 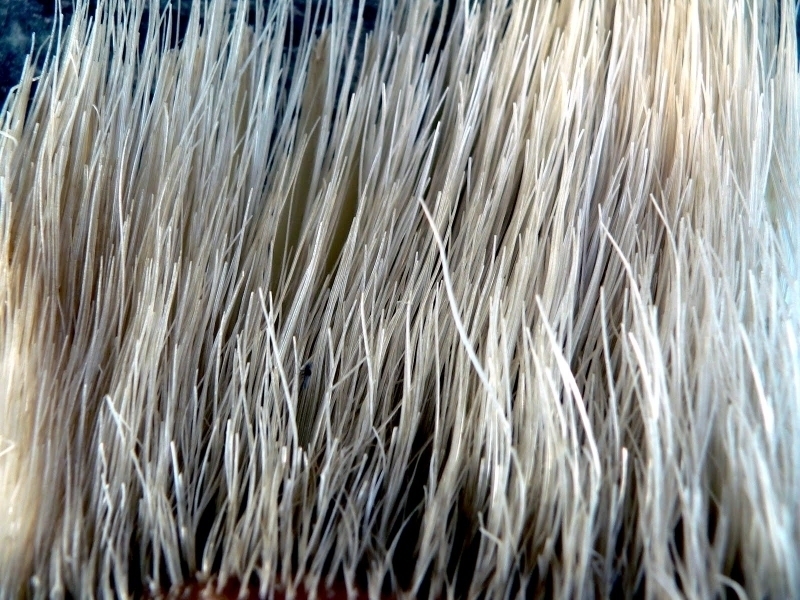 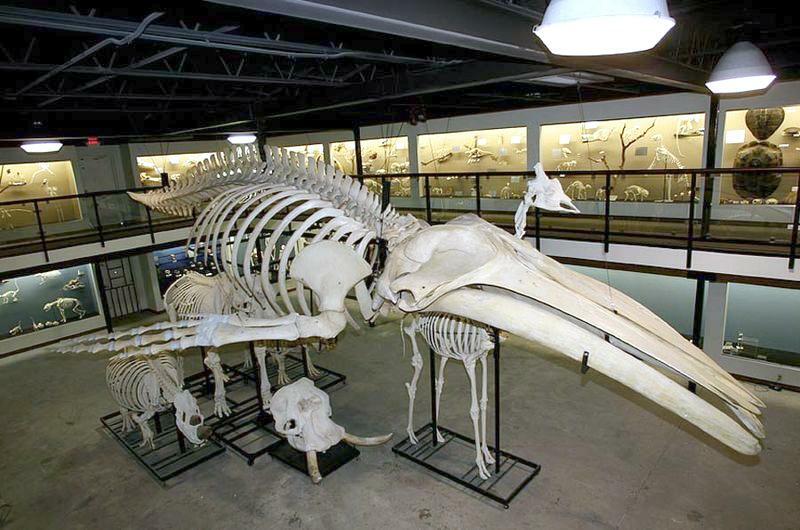 The Humpback Whale has about 330 pairs of dark gray baleen plates with coarse gray bristles hanging from the jaws. 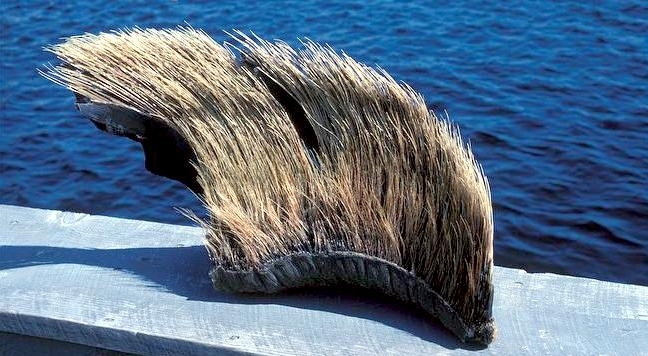 They are about 25 inches long and 13.5 inches wide. 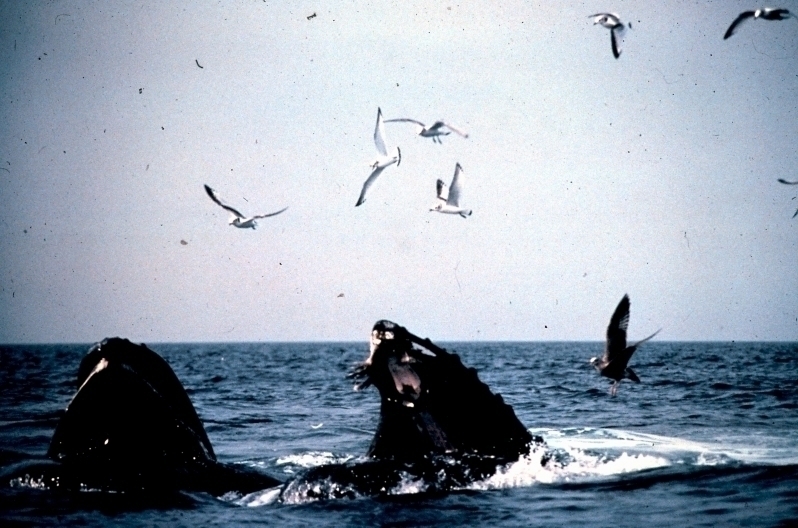 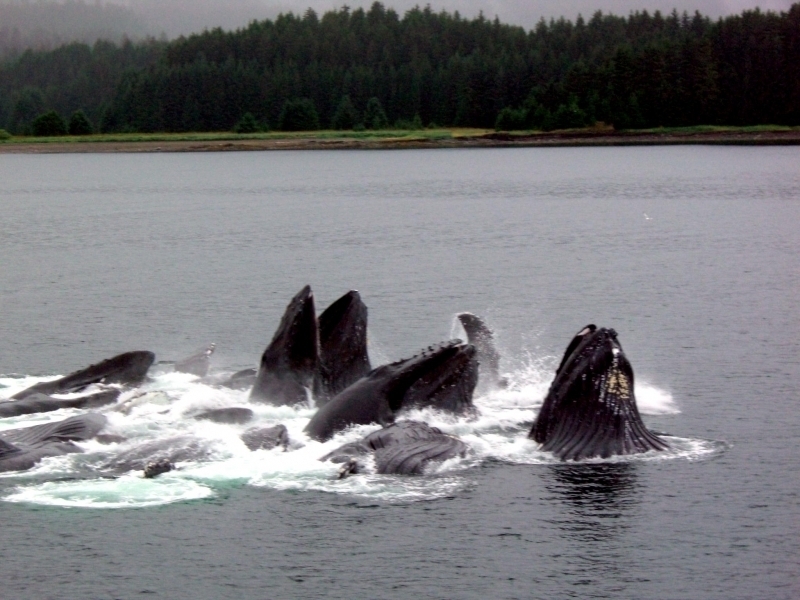 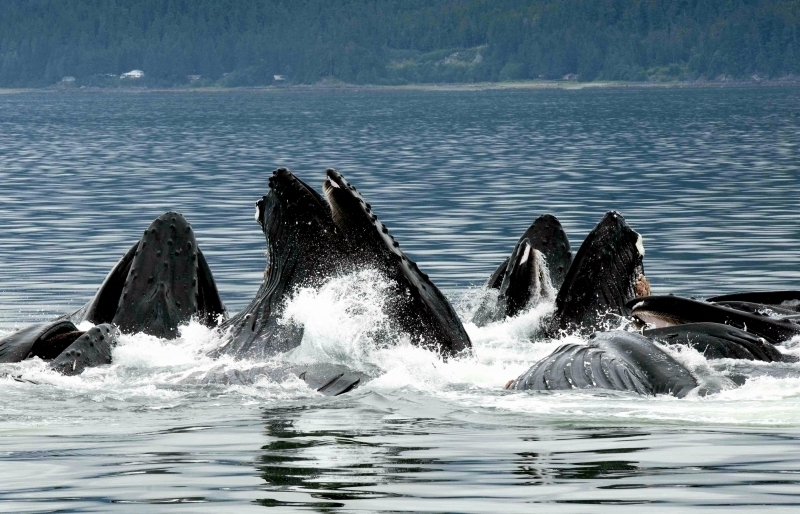 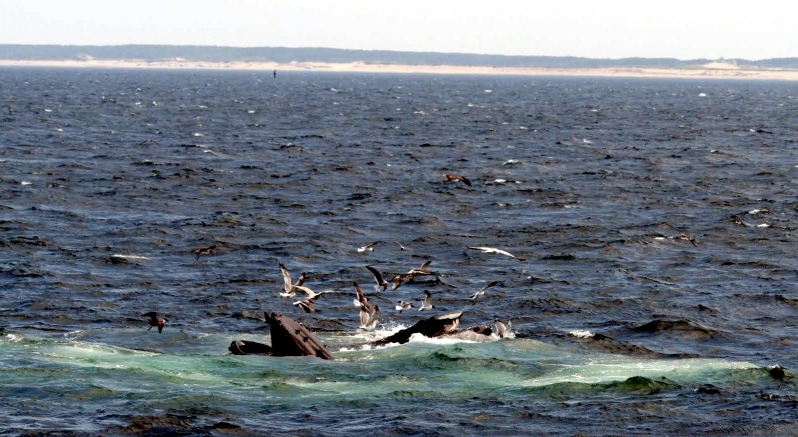 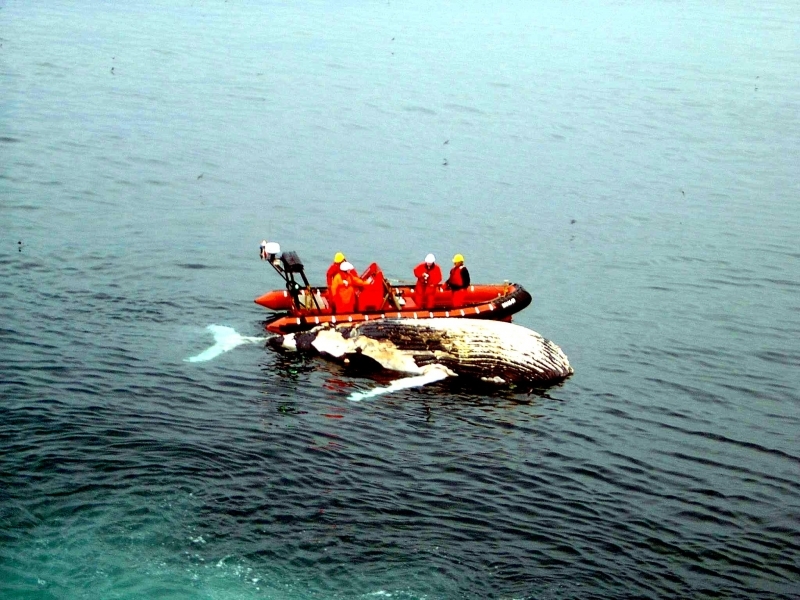 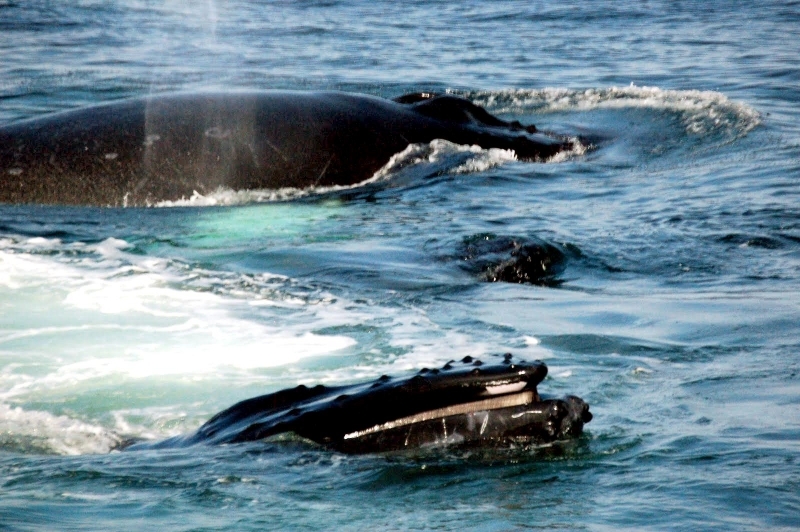 Humpbacks travel in large, loose groups. 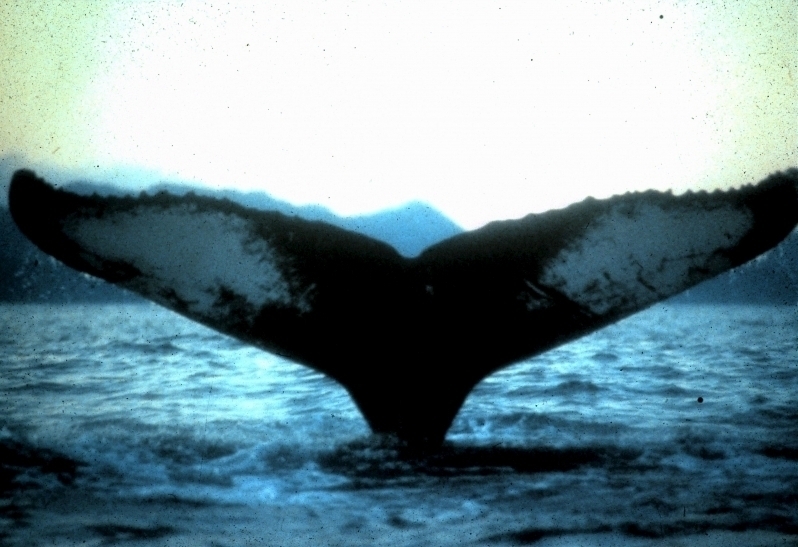 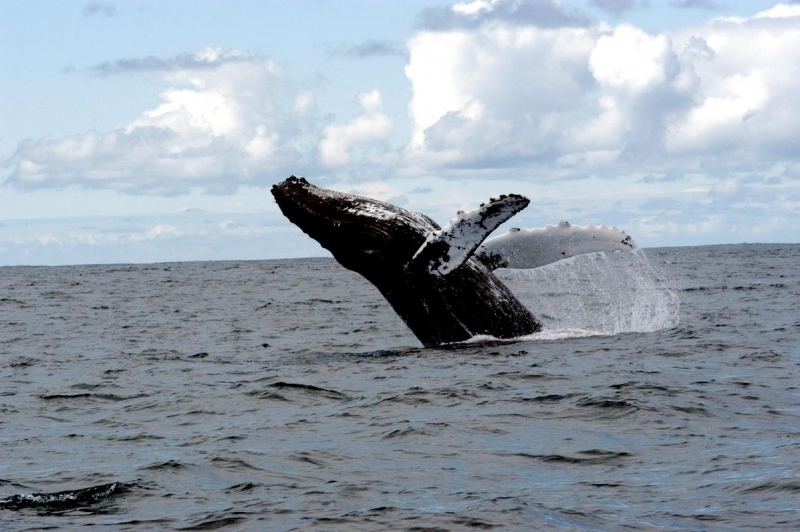 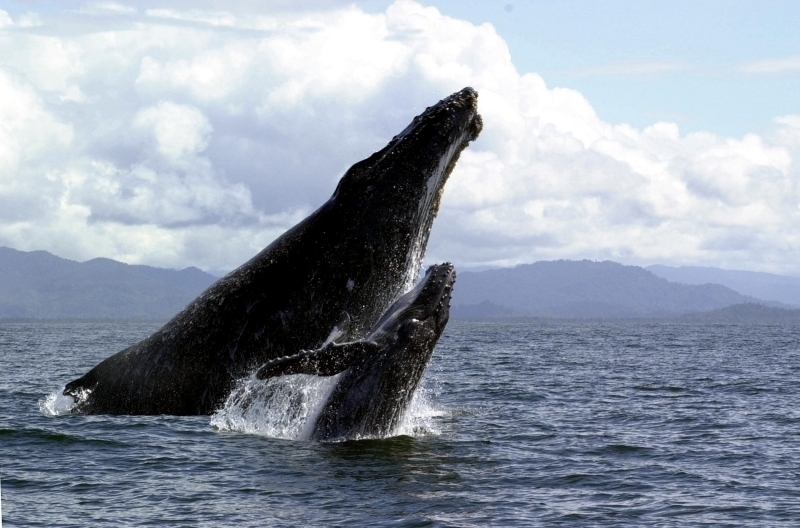 Most associations between Humpbacks are temporary, lasting at most a few days. 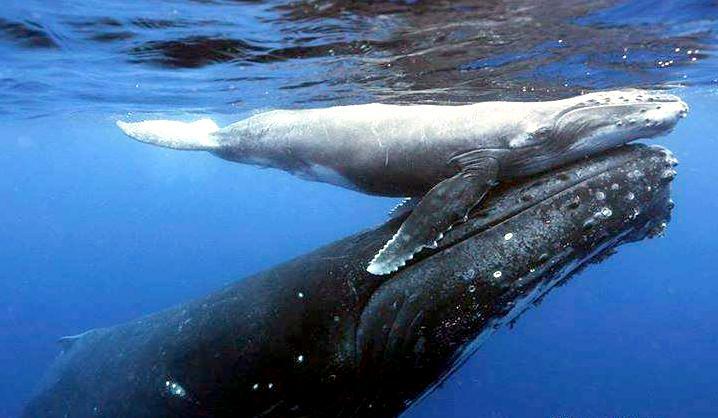 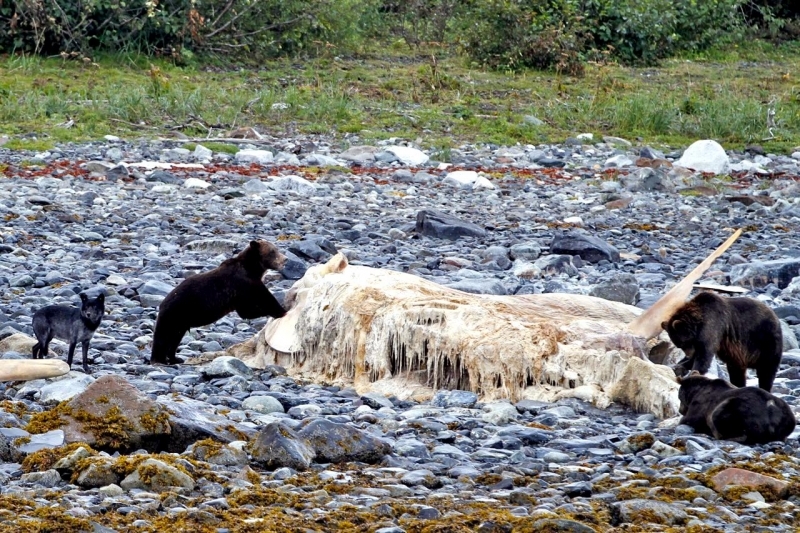 The exception is the strong and lasting bond between mother & calves. 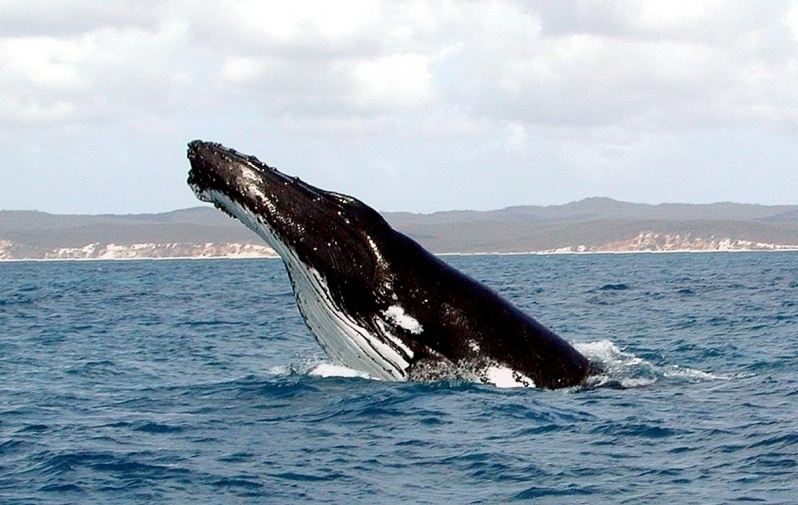 Humpback Whales can dive for up to 30 minutes, but usually last only up to 15 minutes. 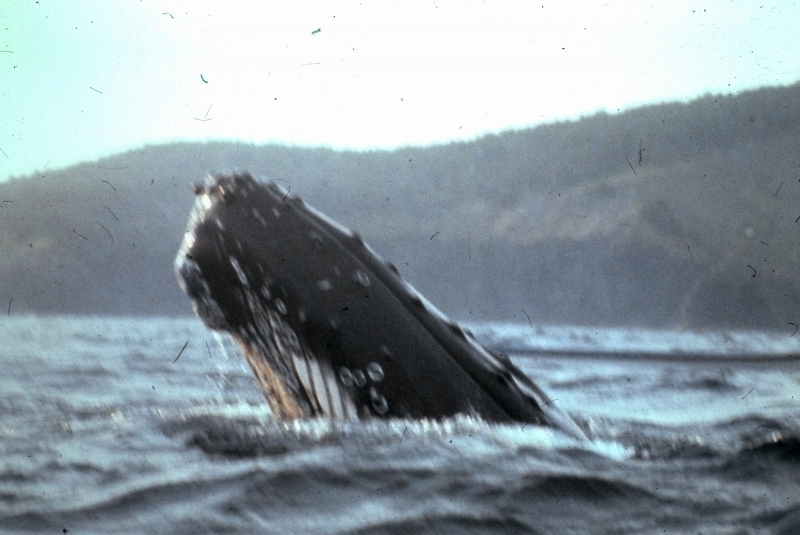 Humpbacks can dive to a depth of 500-700 feet. 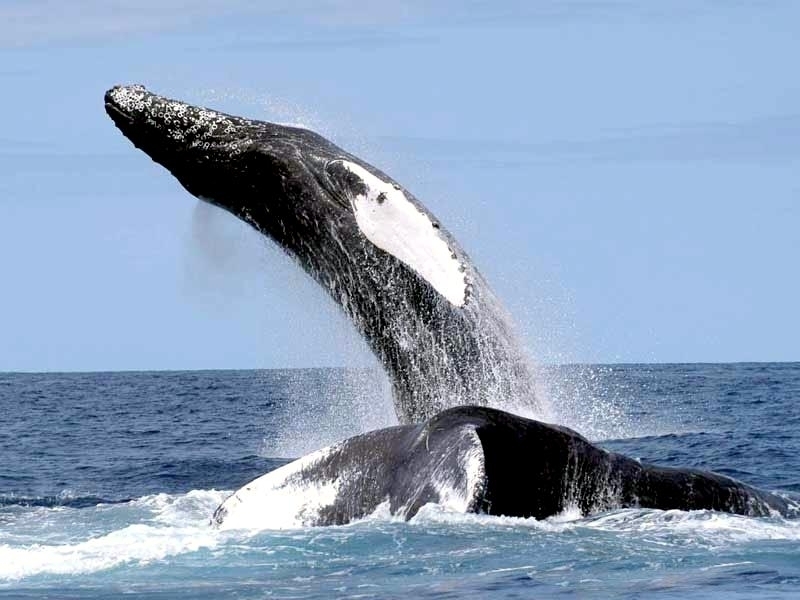 Humpbacks are very acrobatic, often breaching high out of the water and then slapping the water as they come back down. 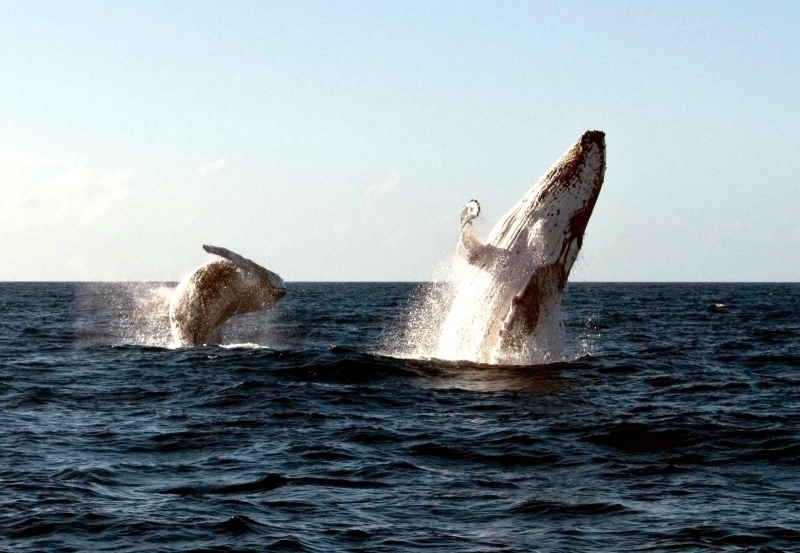 Sometimes they twirl around while breaching. 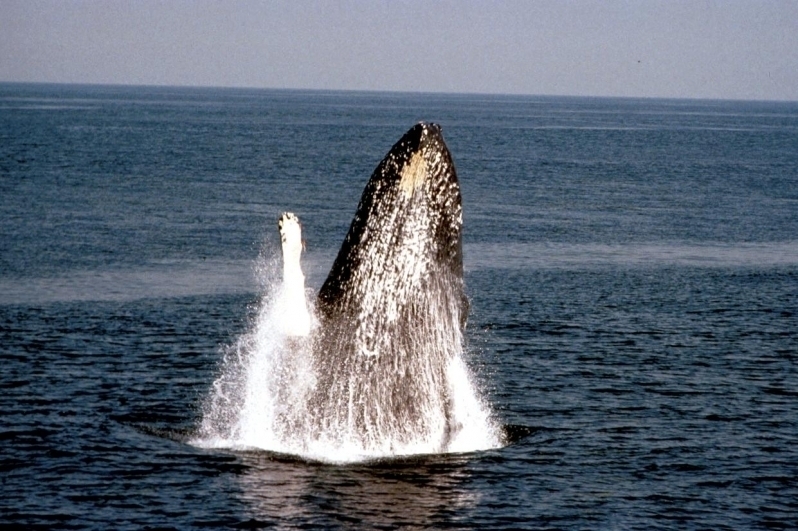 Breaching may be purely for play or may be used to loosen skin parasites or have some social meaning. 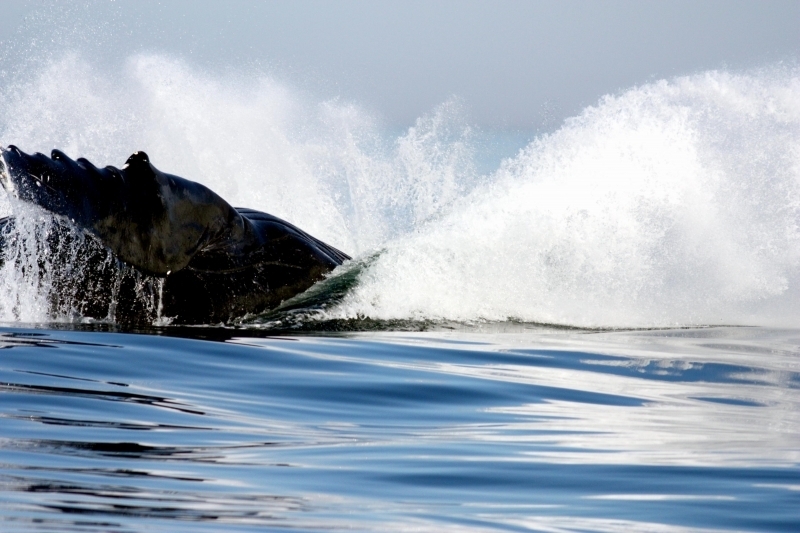 Spyhopping is another Humpback activity in which the whale pokes its head out of the water for up to 30 seconds to take a look around. 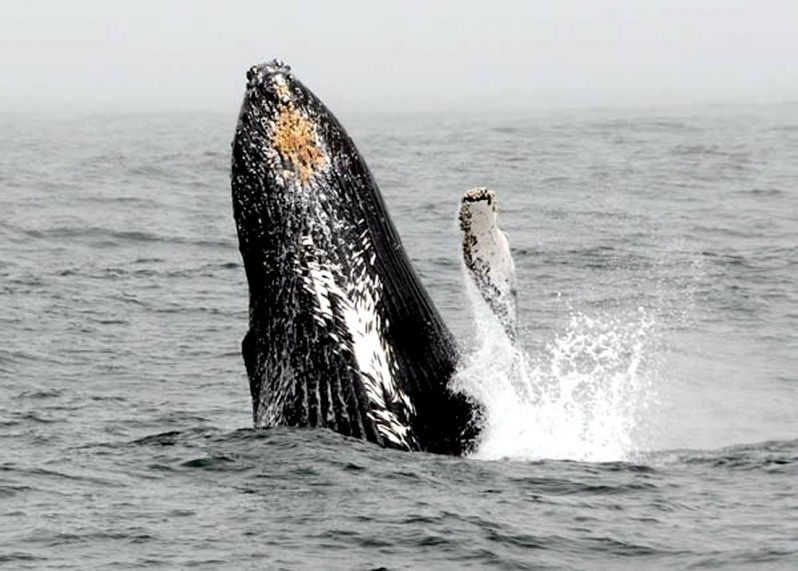 Humpbacks also stick their tail out of the water into the air, swing it around and then slap it on the water’s surface called “lobtailing”. 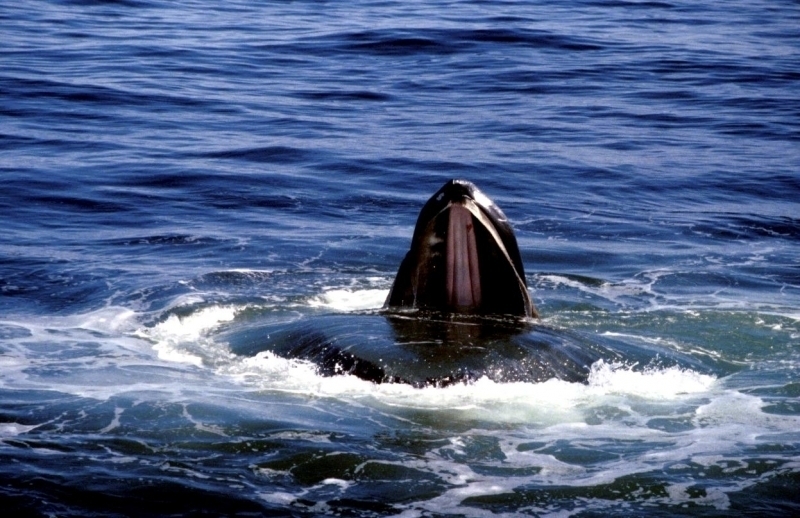 It makes a very loud sound. 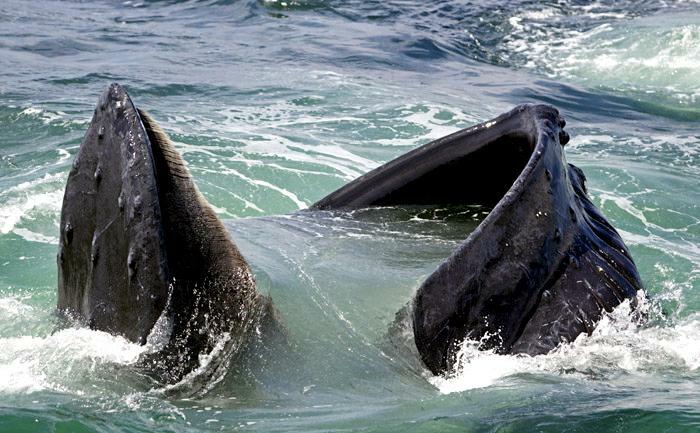 The purpose of lobtailing is unknown, but may be done as a warning to the rest of the pod. 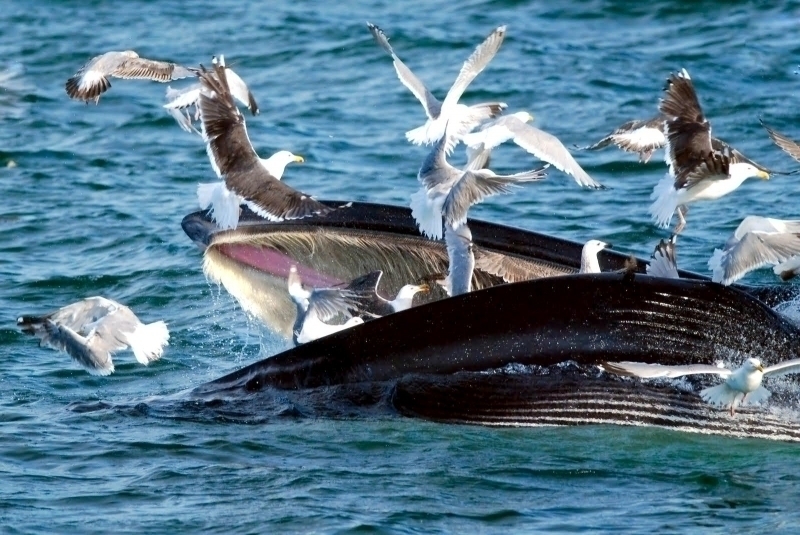 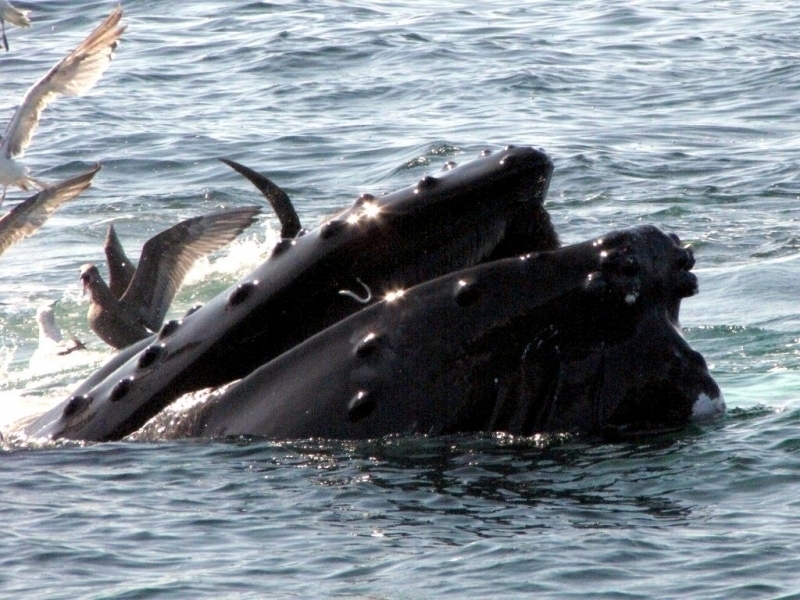 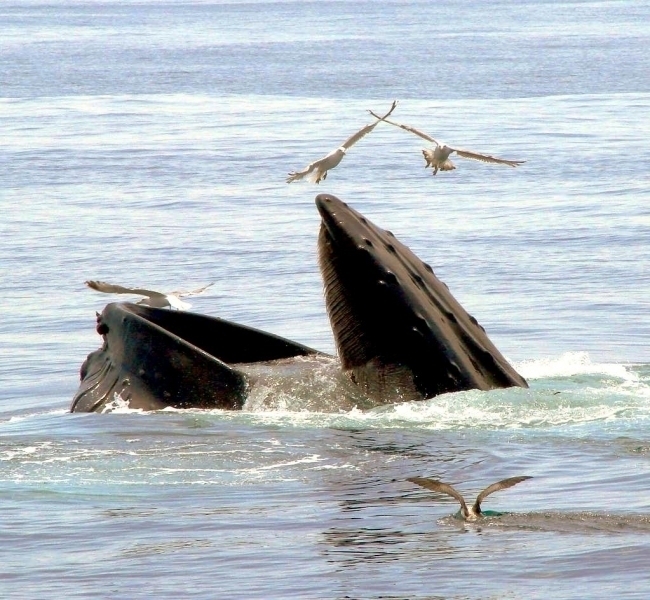 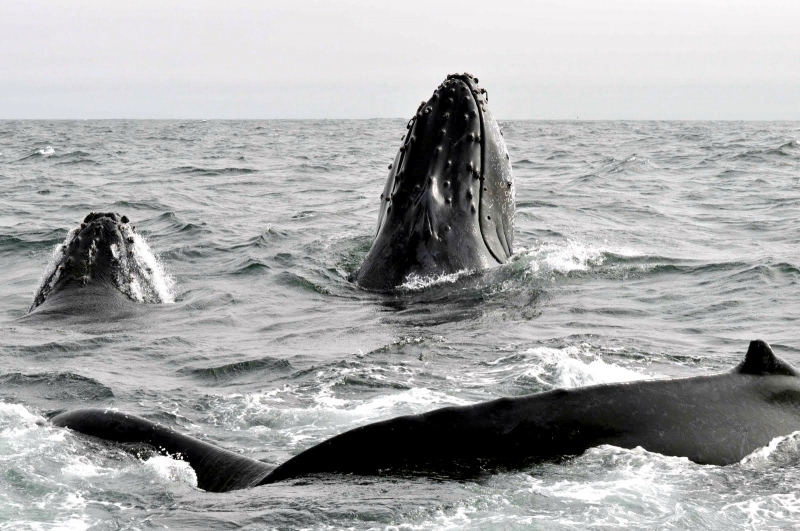 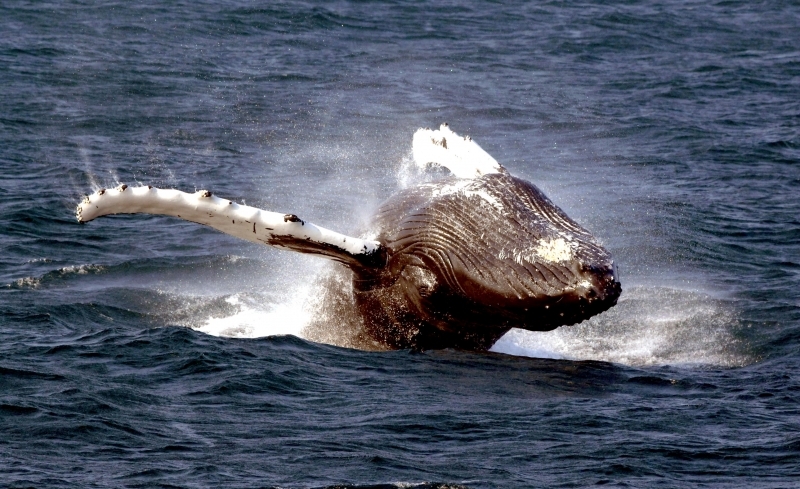 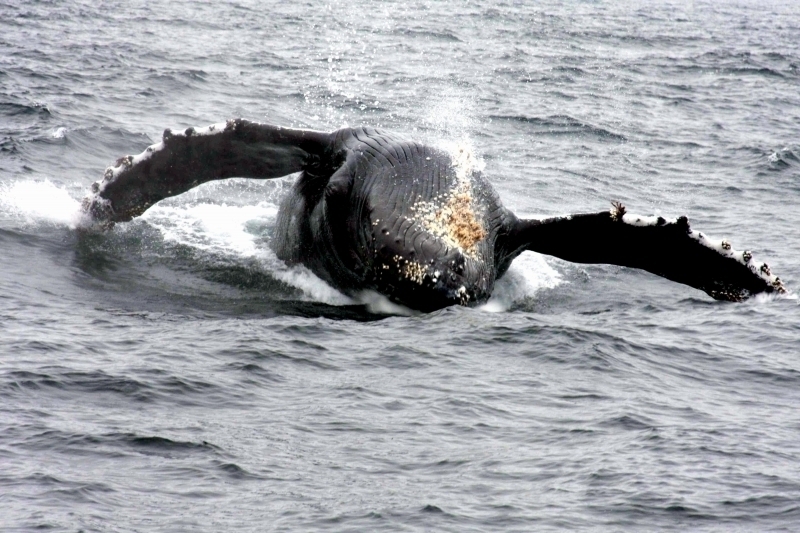 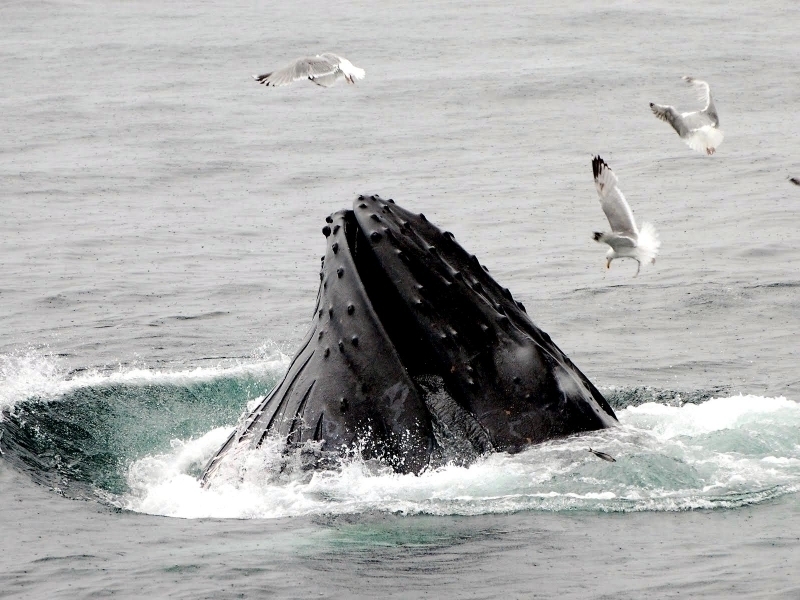 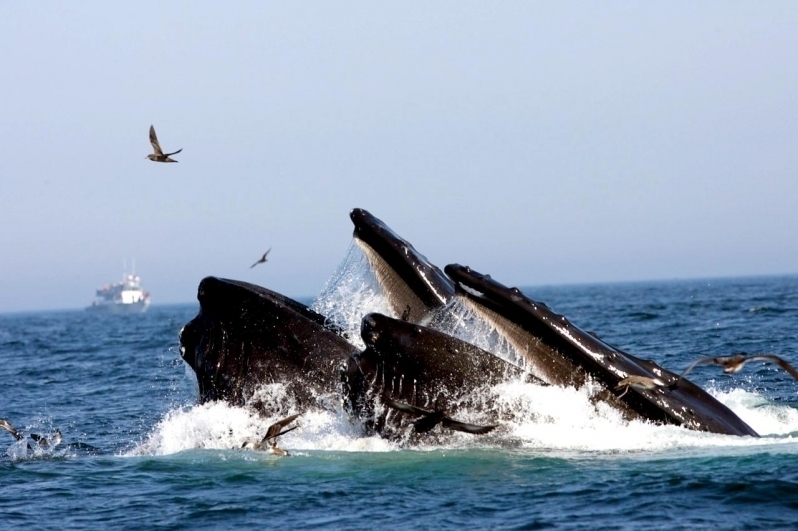 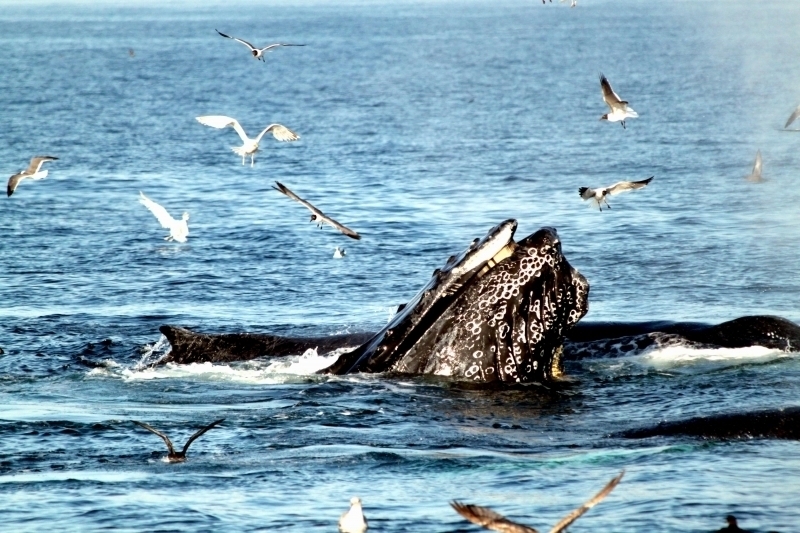 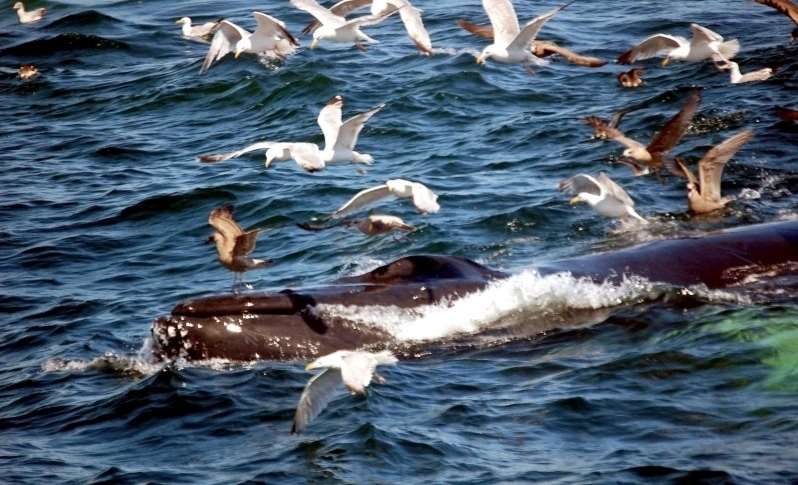 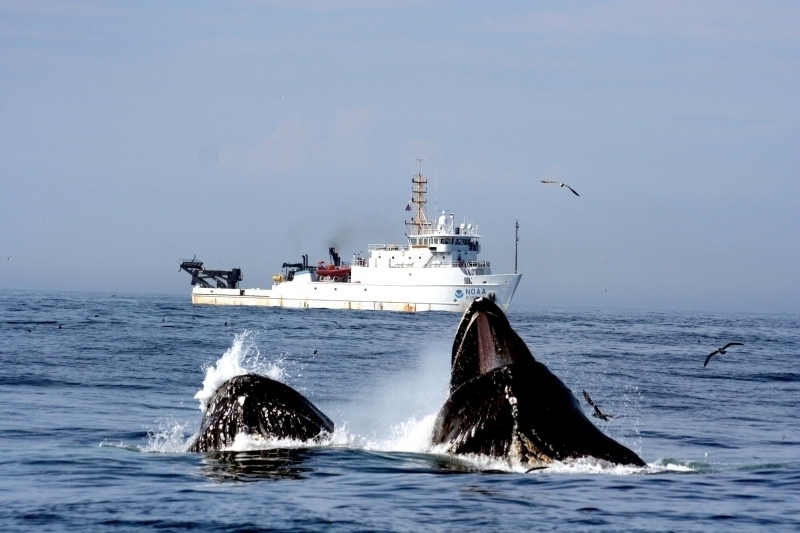 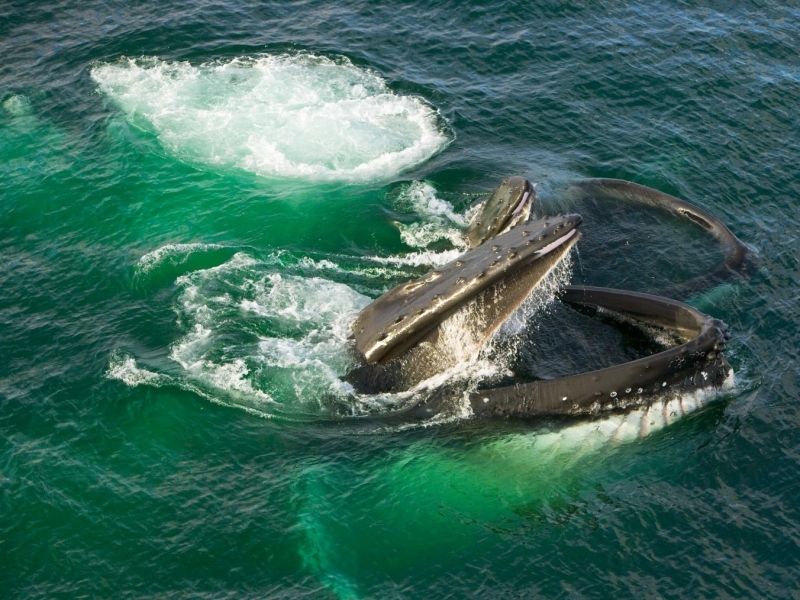 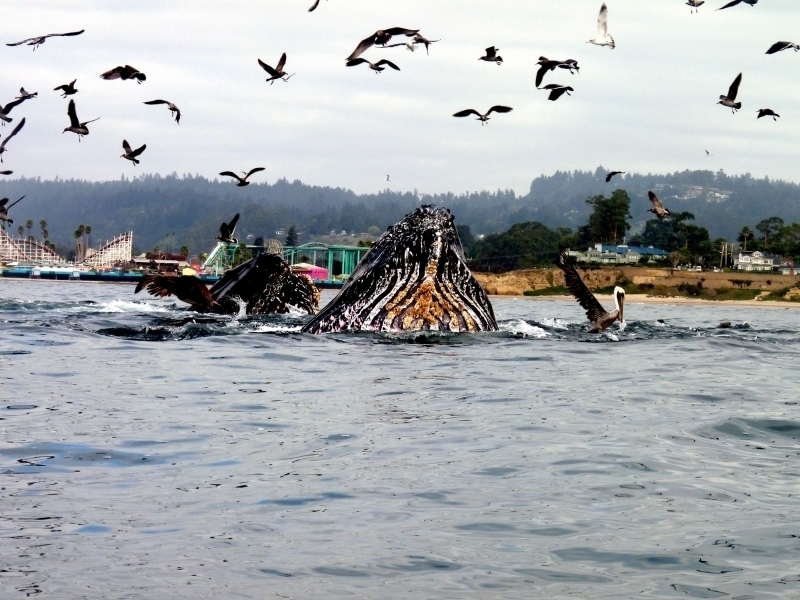 Humpbacks display lobtailing more when the seas are rough & stormy. 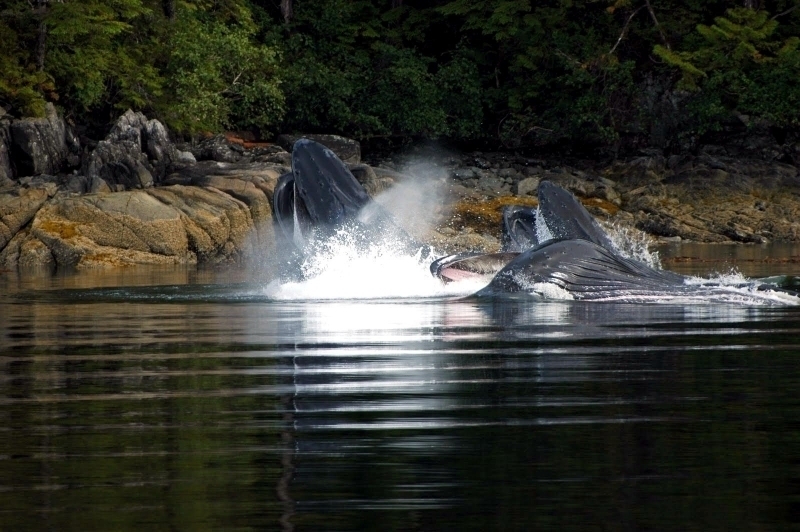 Slapping a pectoral fin against the surface of the water is another unexplained Humpback activity. 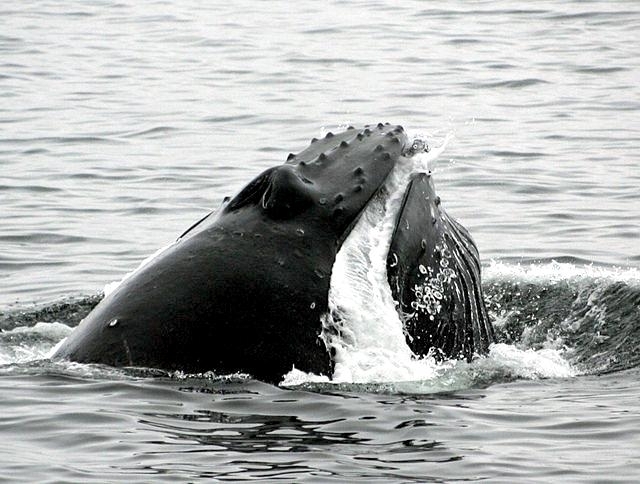 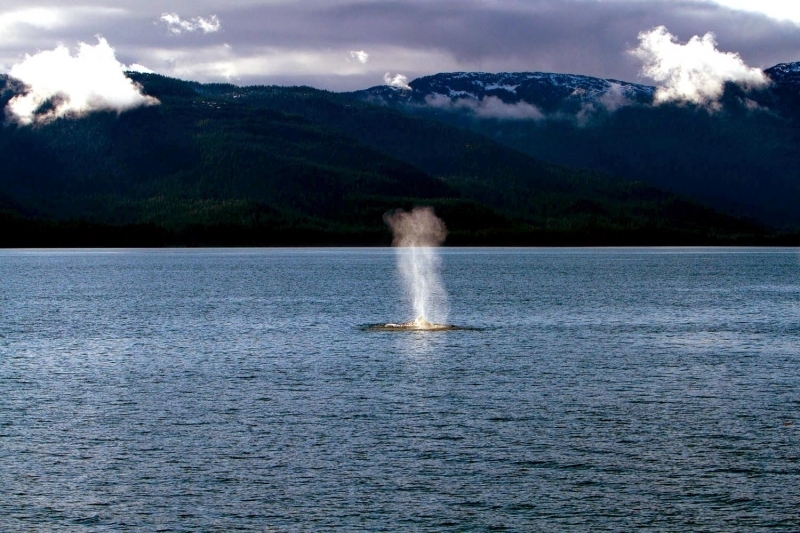 Humpback Whales breathe air at the surface of the water through 2 blowholes located near the top of the head. 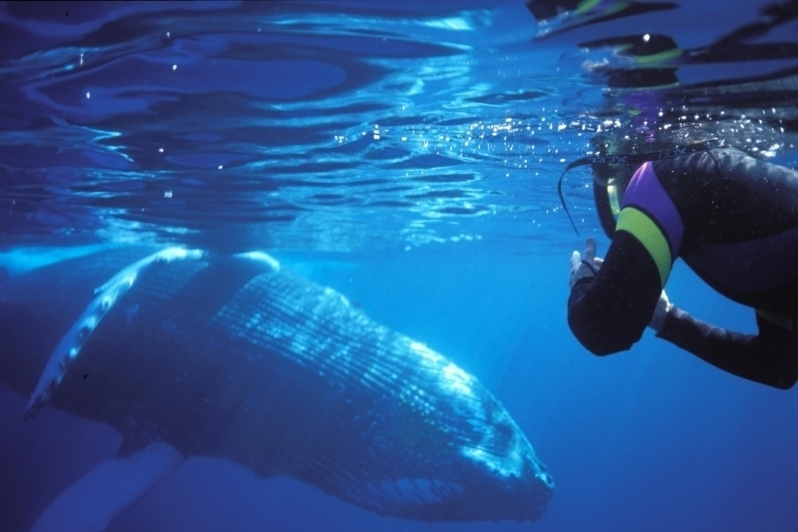 They spout (breathe) about 1-2 times per minute at rest, and 4-8 times per minutes after a deep dive. 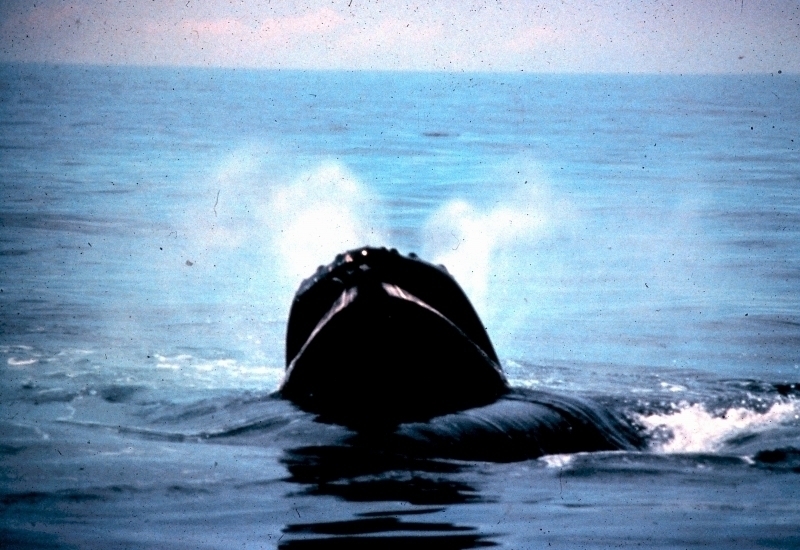 Their blow is a double stream of spray that rises 10-13 feet above the surface of the water. 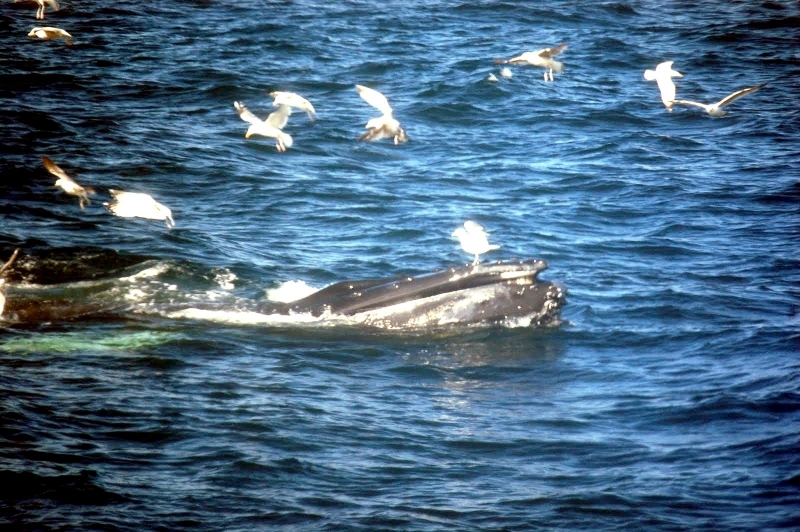 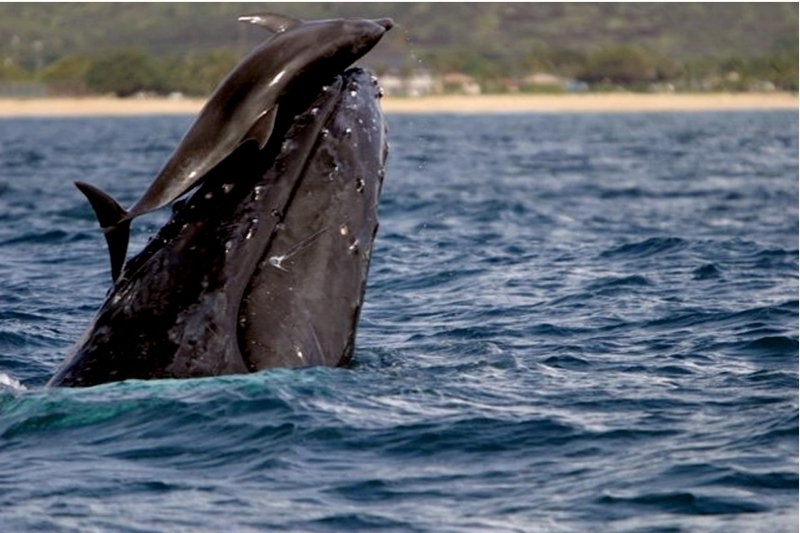 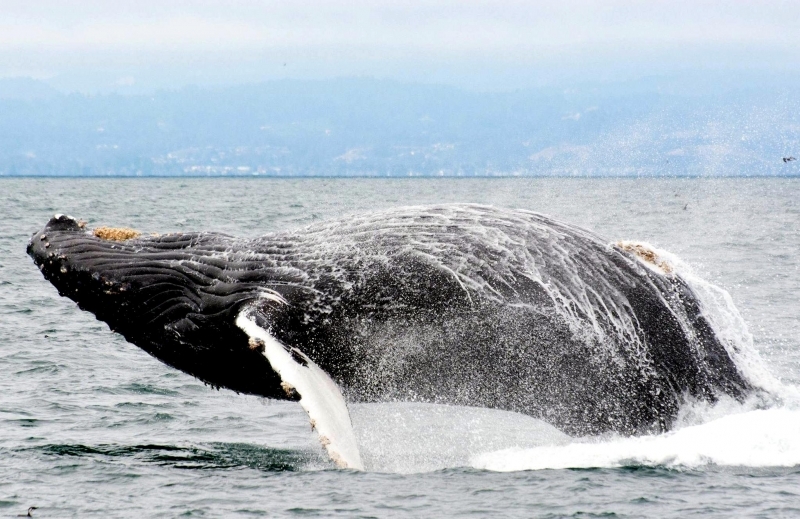 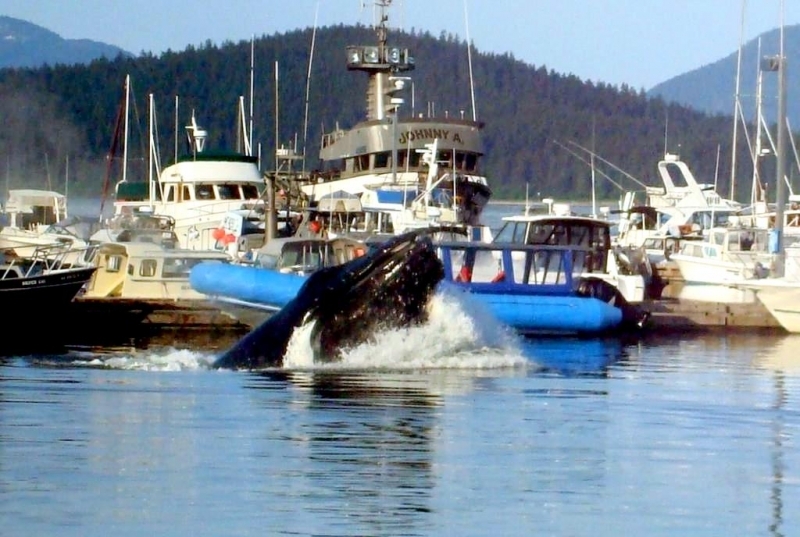 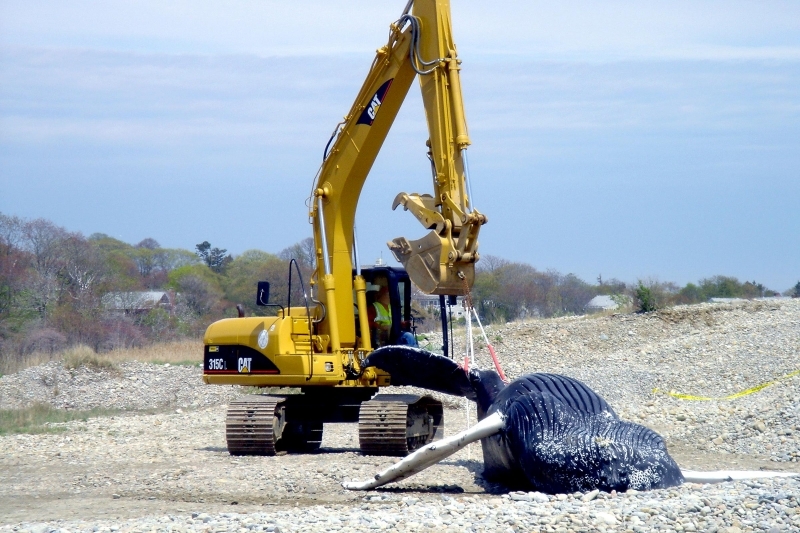 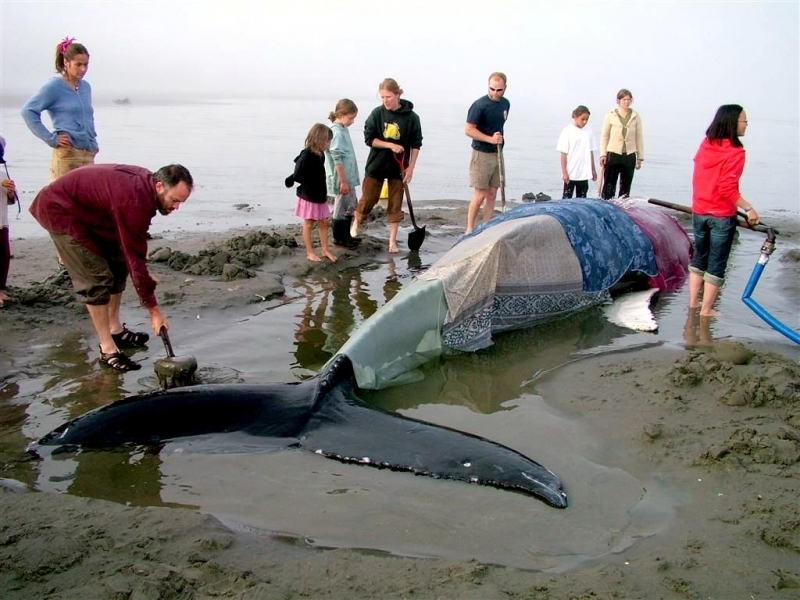 Humpbacks normally swim 3-9 mph, but can go up to 15-16.5 mph in bursts when in danger. 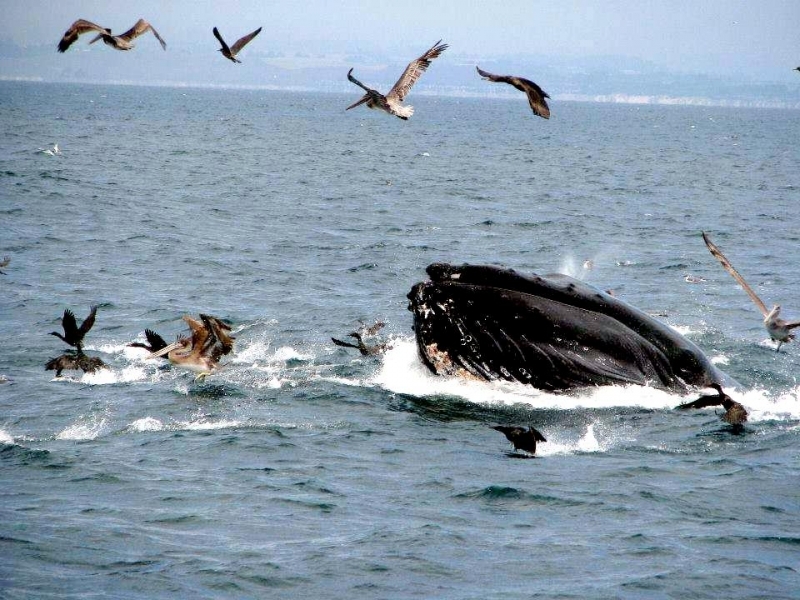 Feeding speeds are slower, about 1.2-3.5 mph. 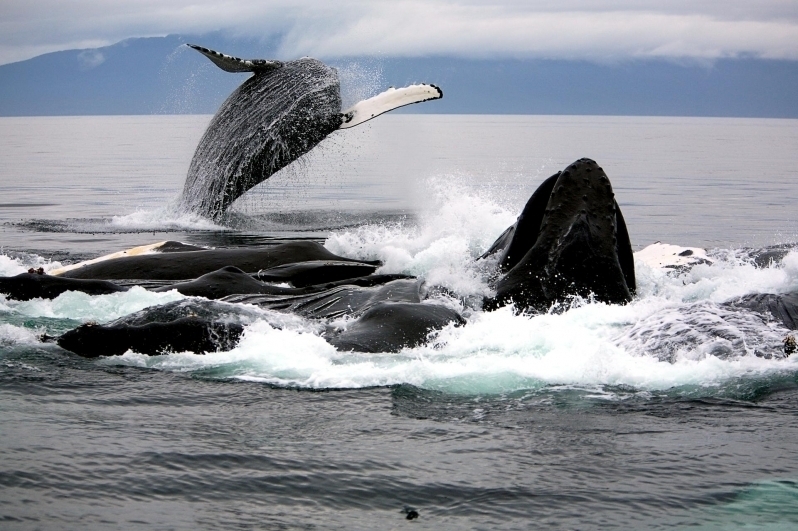 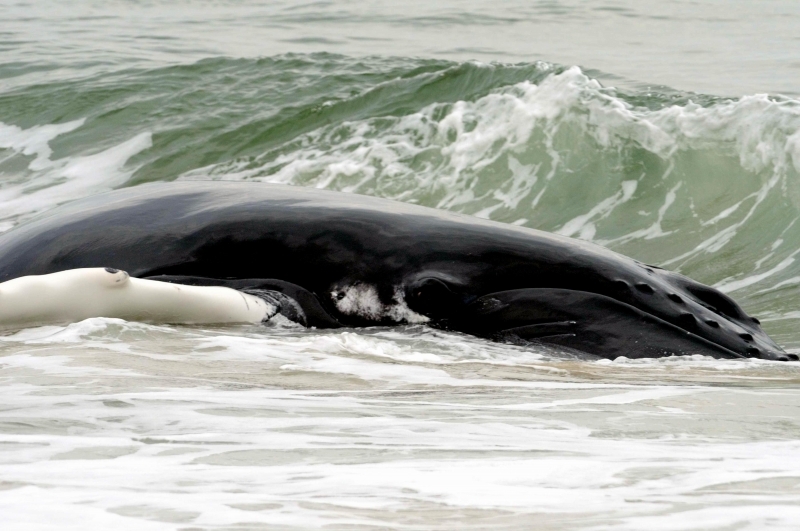 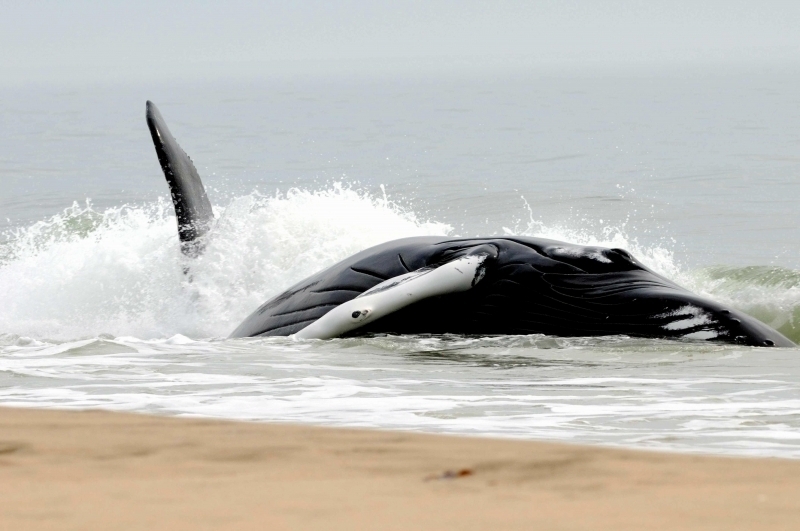 Killer Whales are the biggest threat to any Humpback especially calves traveling with their mother. 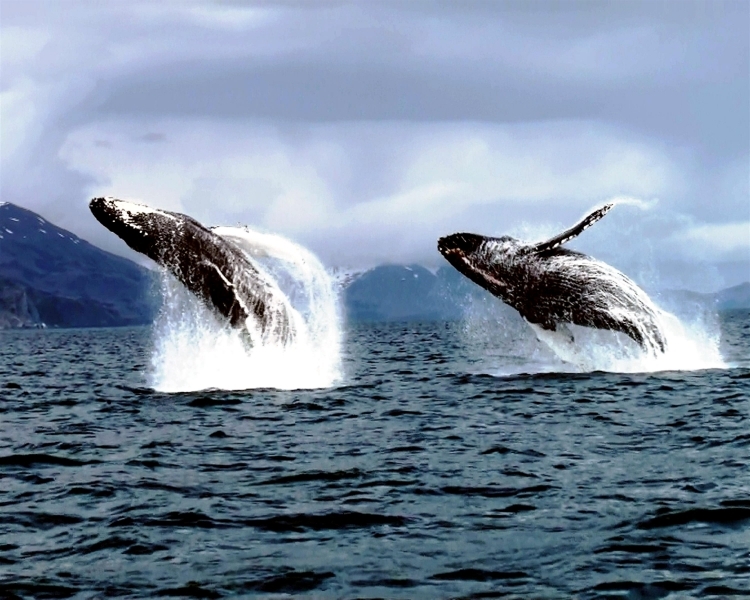 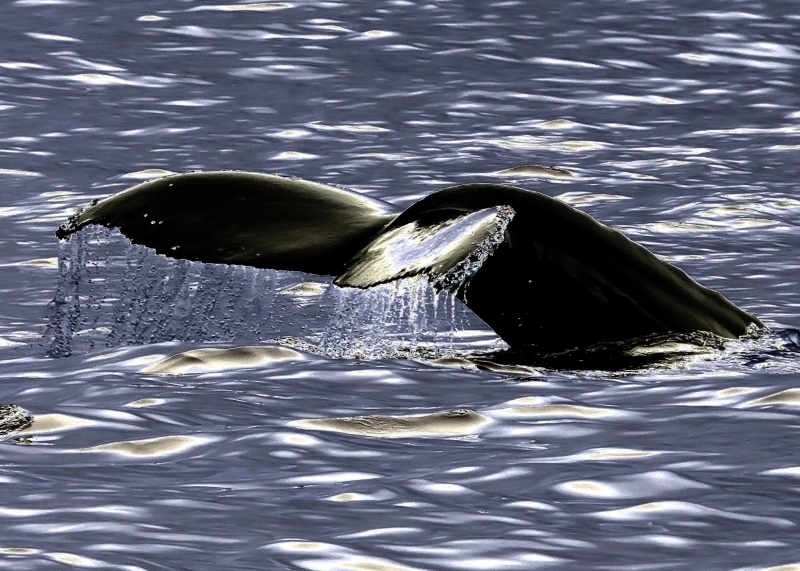 Humpback Whales are the noisiest and most imaginative whales when it comes to songs. 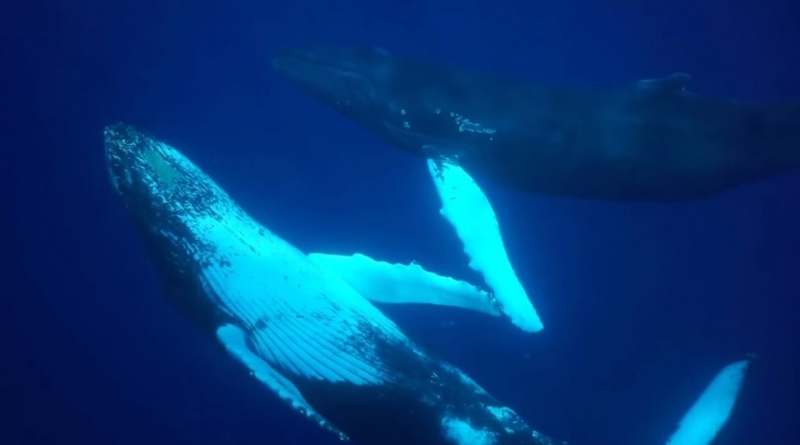 They have long, varied, complex, eerie and beautiful songs that include recognizable sequences of squeaks, grunts and other sounds. 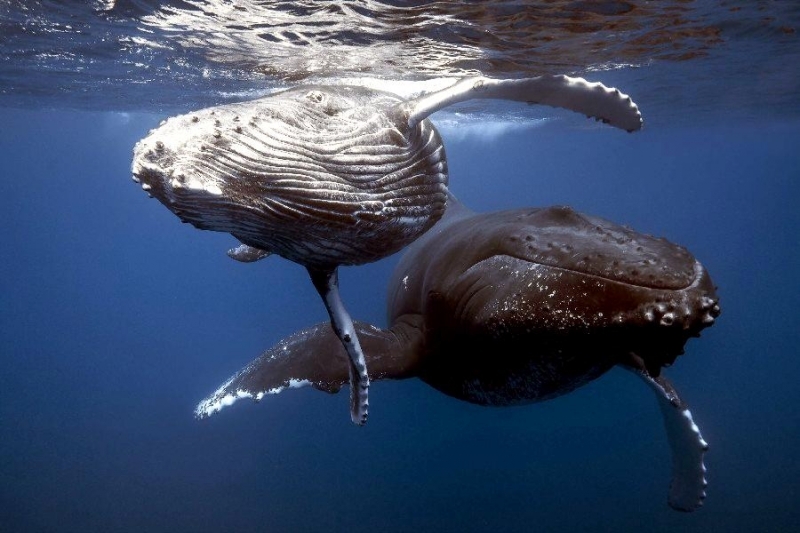 The songs have the largest range of frequencies used by whales, ranging from 20 to 9,000 mhz and only the males have been recorded singing. 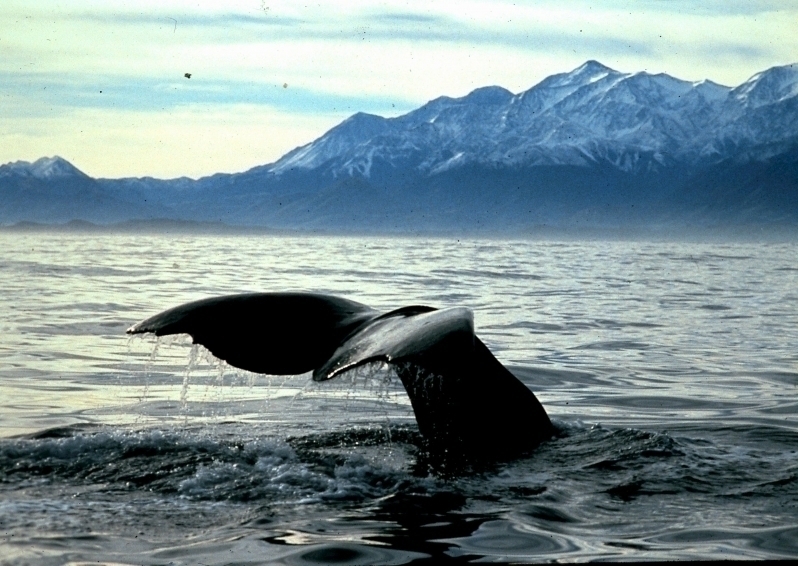 They sing the complex songs only in warm waters, perhaps used for mating purposes. 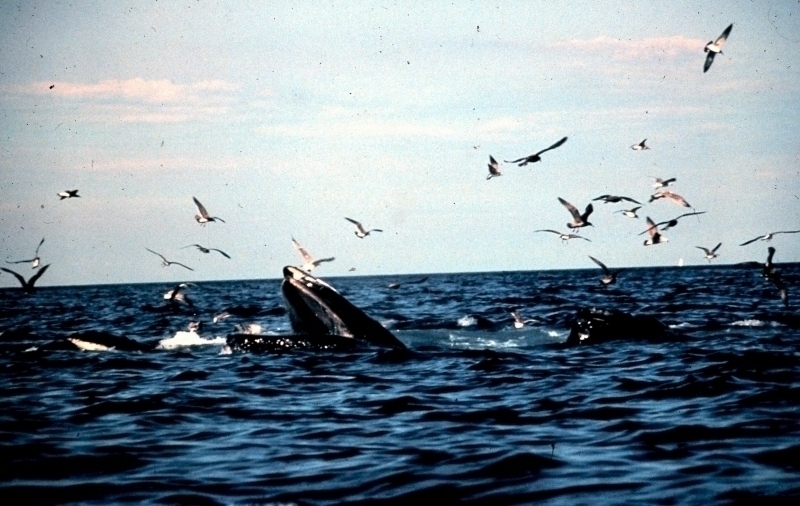 In cold waters, they make rougher sounds, scrapes and groans, perhaps used for locating large masses of krill (the tiny crustaceans that they eat). 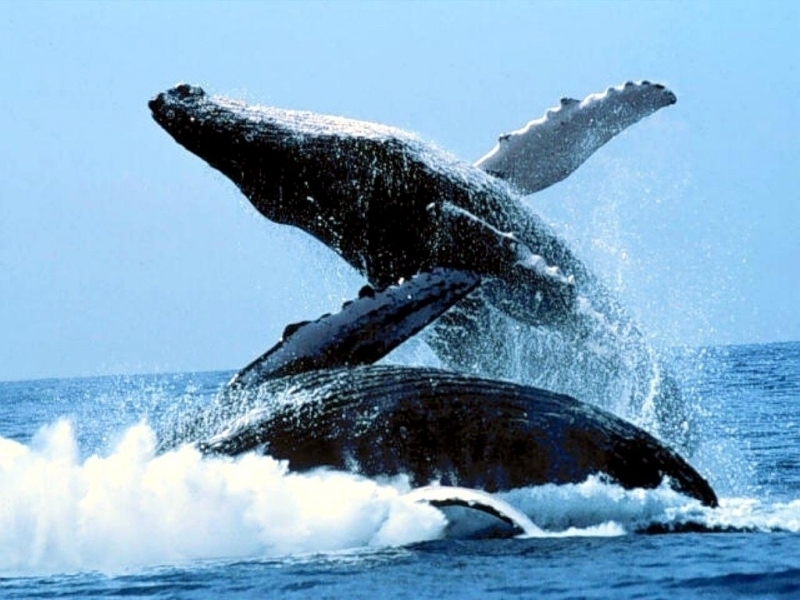 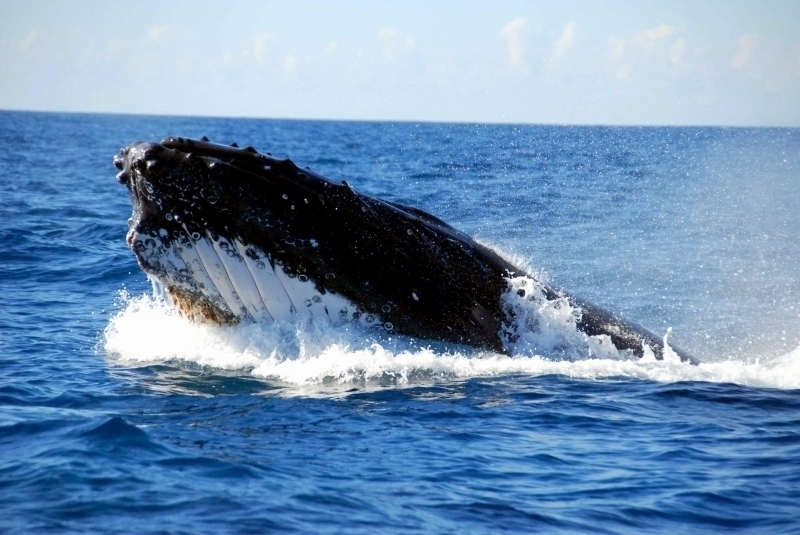 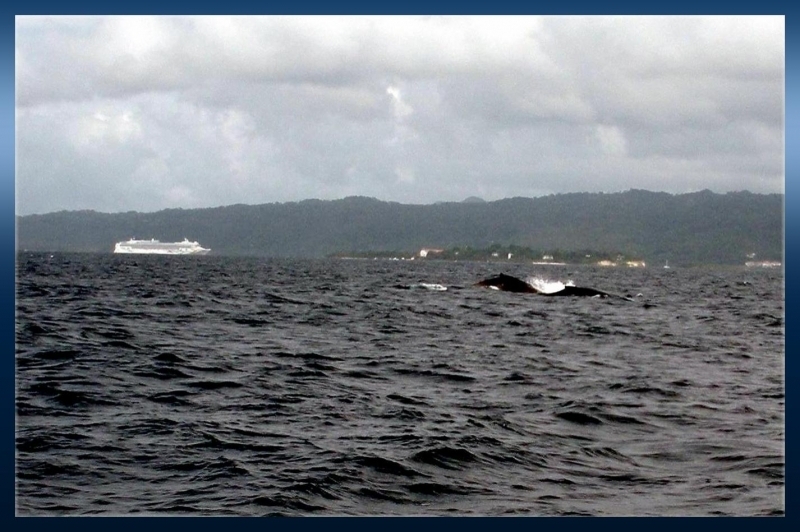 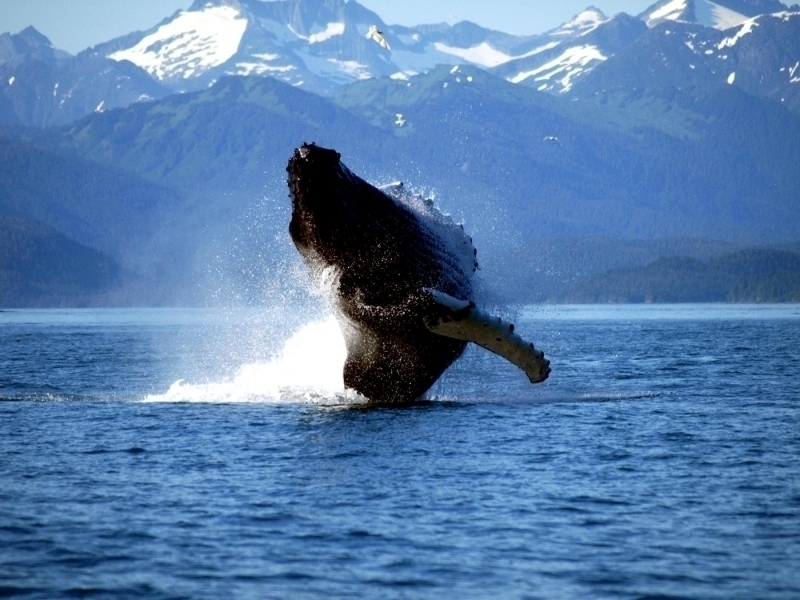 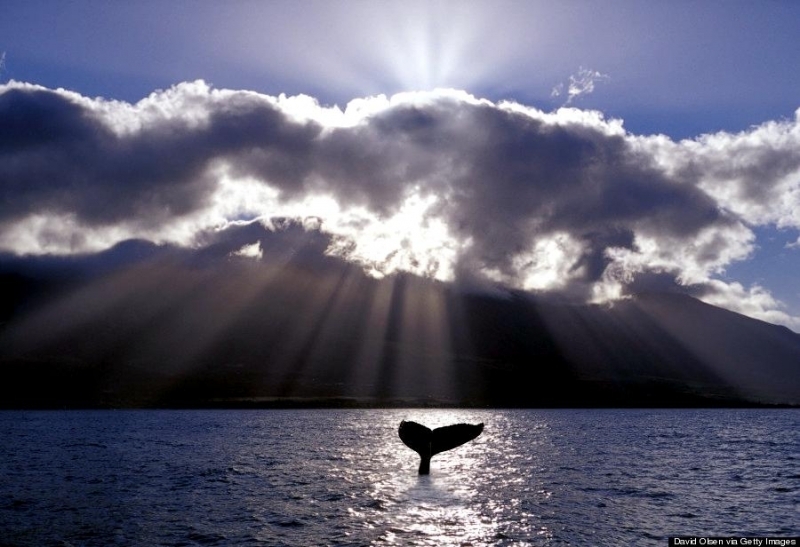 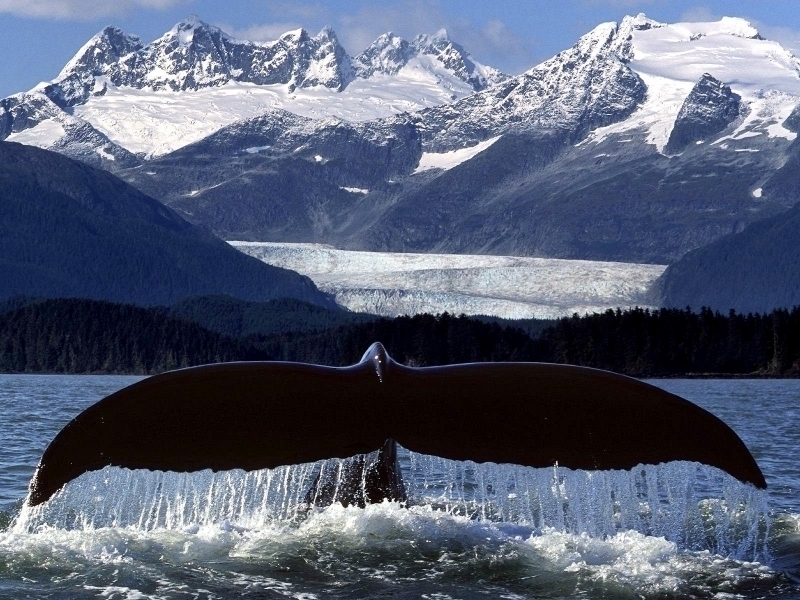 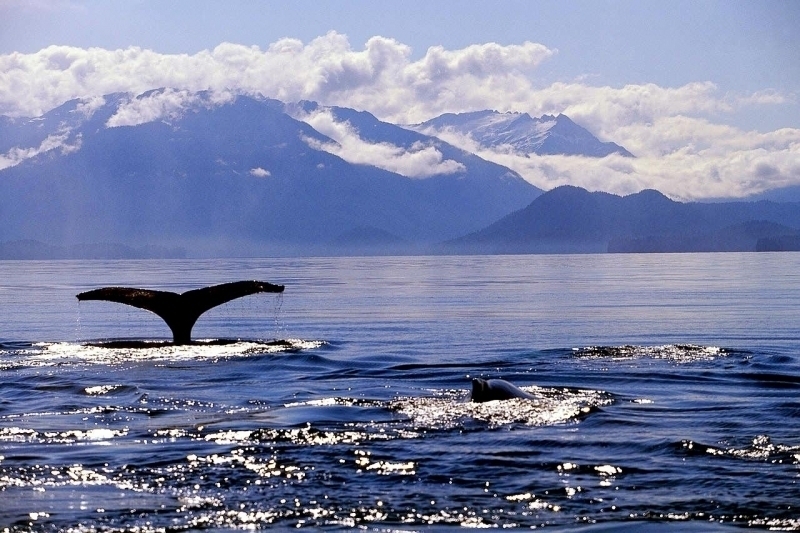 Humpback Whales live at the surface of the ocean, both in the open ocean and shallow coastline waters. 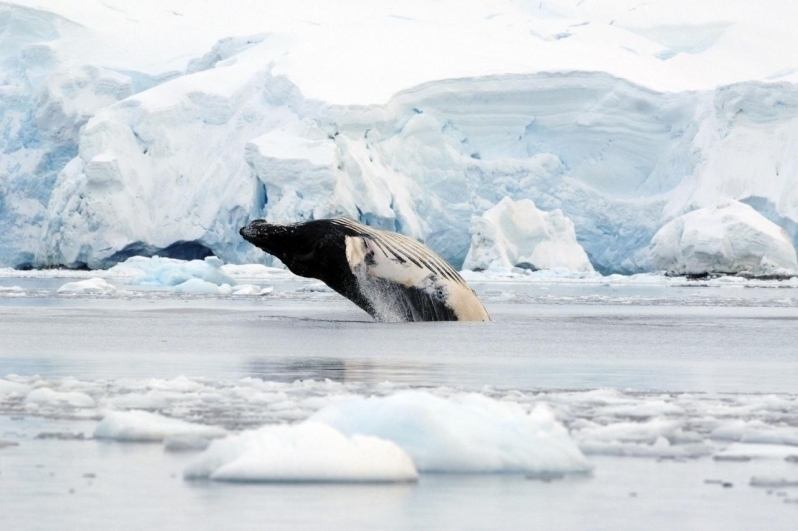 When not migrating, they prefer shallow waters and migrate from warm tropical waters where they breed and calve to Arctic waters where they eat. 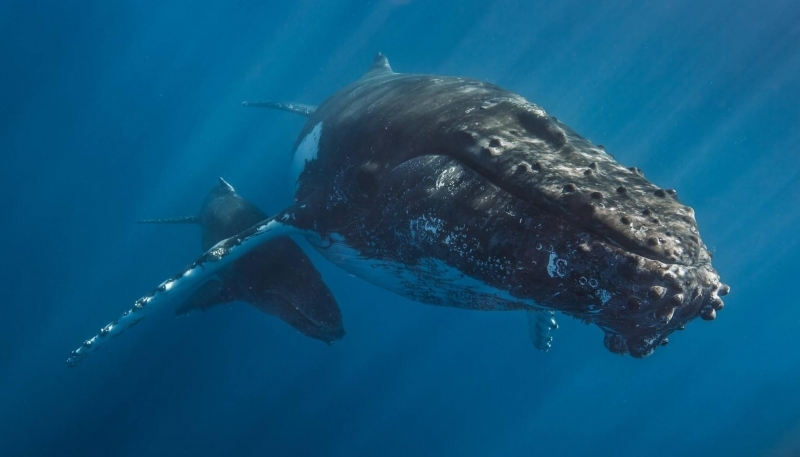 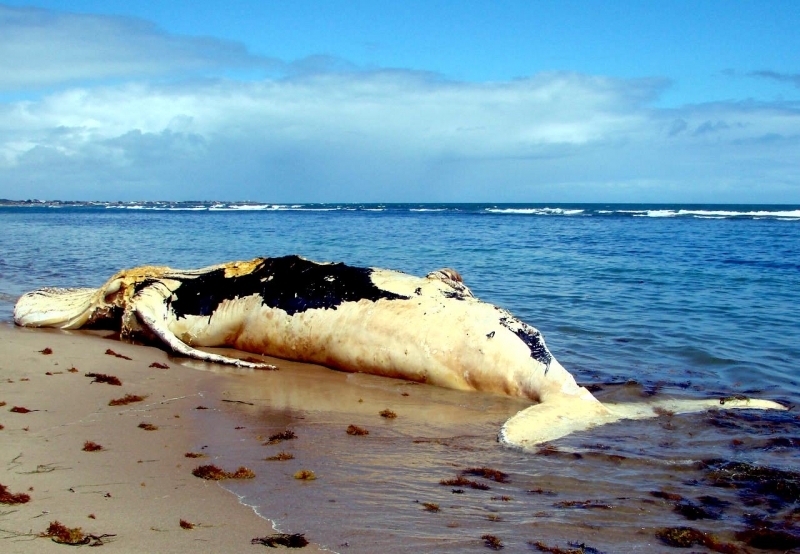 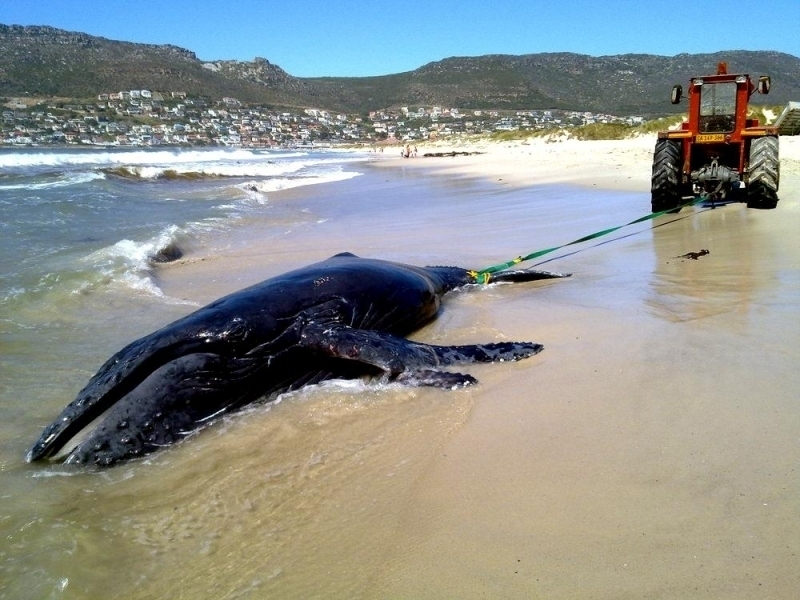 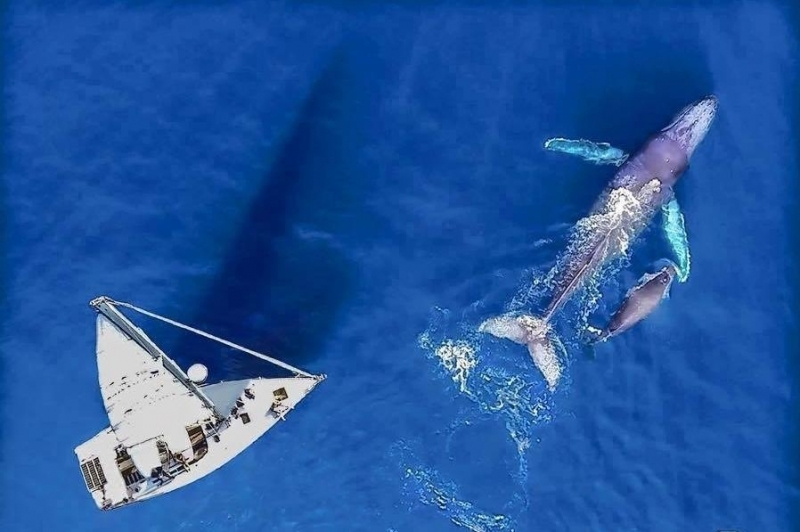 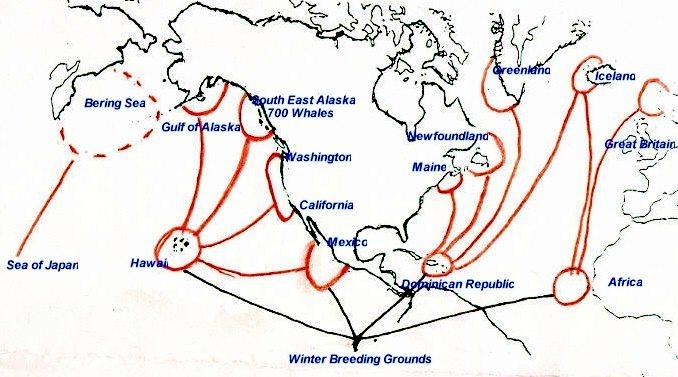 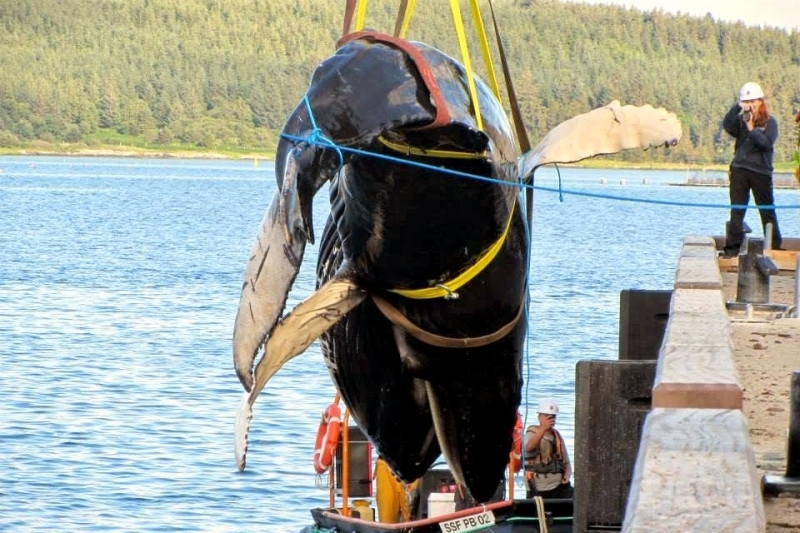 There are 3 separate populations of Humpbacks, those living in the North Pacific Ocean, those in the North Atlantic Ocean and those roving the oceans of the Southern Hemisphere.